TWO TD BANK 250’S IN A ROW FOR EDDIE! 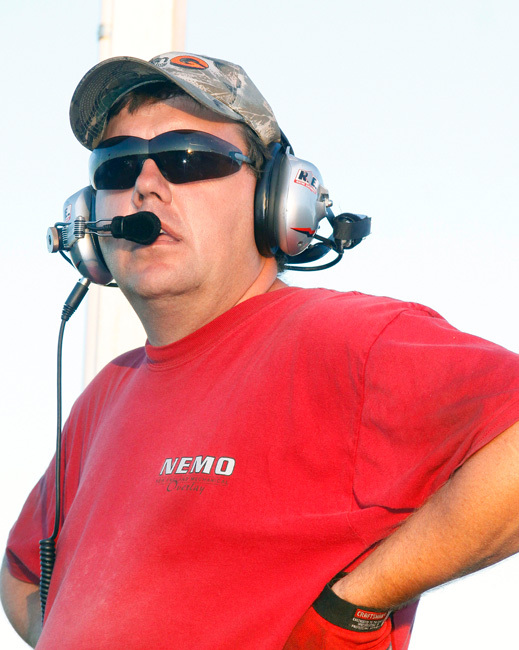 “We have to get there first,” responded crew chief Rollie LaChance before practice even began on Saturday when asked if he and Eddie could make it two wins in a row at the Oxford Plains Speedway spectacular known as the TD Bank 250. Get there they did to etch their names into the record books as only one of four who have ever gone back to back. 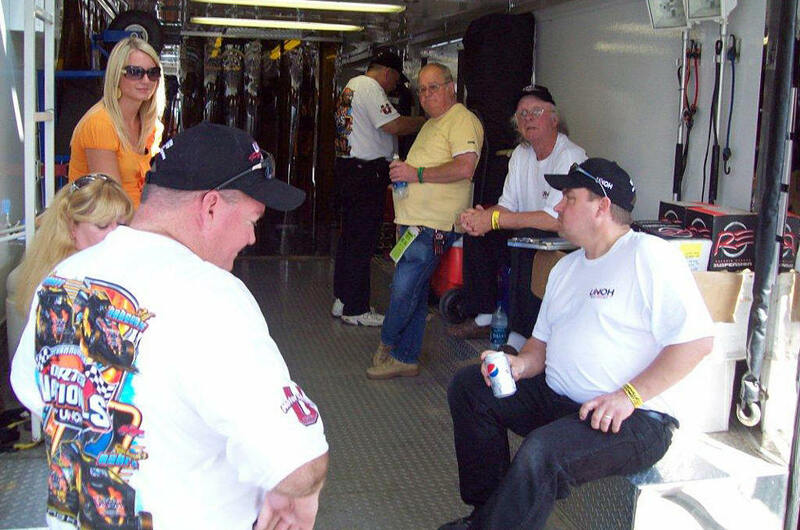 Only Geoff Bodine, Mike Rowe and Ralph Nason have been able to accomplish the feat and with three in a row for Nason so now the “Outlaw” has something to shoot for next year. 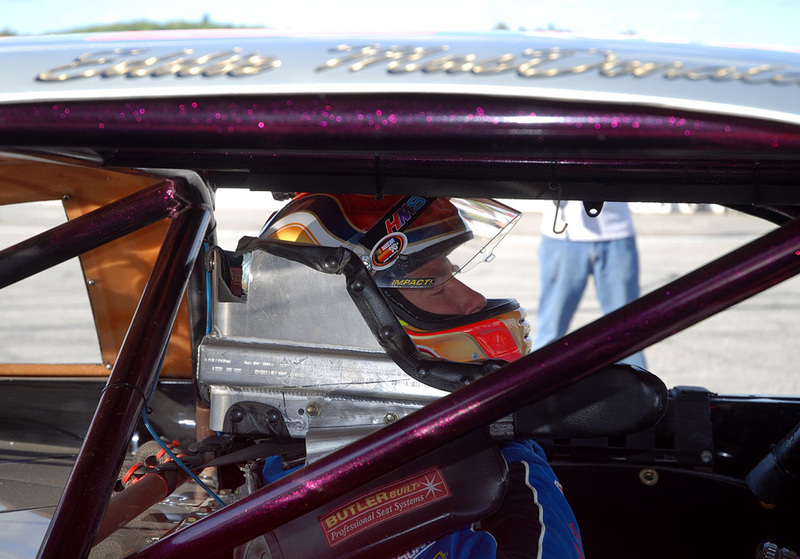 Eddie started ninth after finishing second in the third of six heats that saw 79 cars try to qualify for the 39 starting positions. The field was so strong that Cup regular Brad Keselowski had to receive a promoter’s provisional to even make the race while Jeffrey Earnhardt was not able to make the starting grid. Oxford Plains was at its best affording a lot of three wide racing in the heats and the feature. Only five cars finished on the lead lap but it was the lapped cars that played an important role in the outcome. There were still a strong field running near the end and it was difficult for the leaders to move through the pack of bunched up racecars. 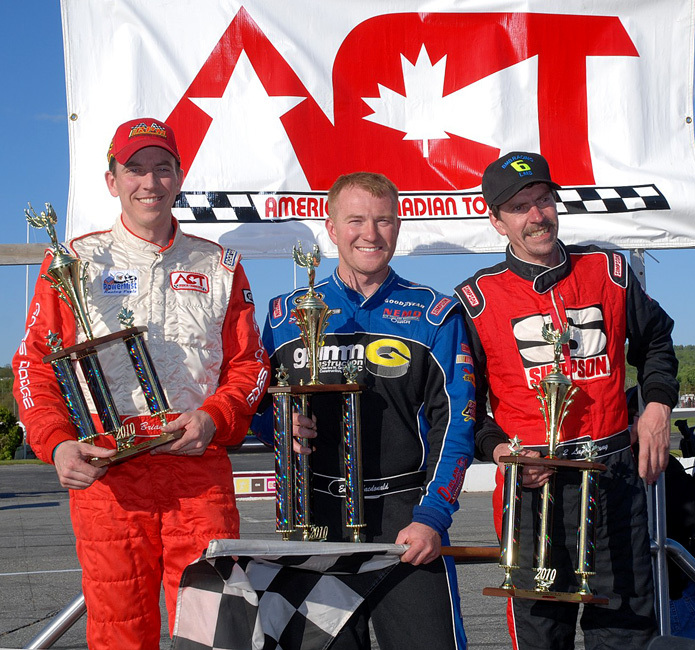 Pole winner and ACT point’s leader Brian Hoar showed great speed in practice and qualifying but it was veteran racer Brad Leighton who took command early on lap 14 and maintained a solid lead for 189 laps until a right front tire exploded. Instead of going to the pits the cagey driver raced into turn one and spun through the dirt to bring out a caution flag allowing him to stay on the lead lap when the green flag waved again on lap 203. The move paid off at the end of the race with a hard charge back through the field to finish fifth and the last car on the lead lap. It was Leighton however that made short work of the competition from six on back as he put everyone a lap down before the halfway flag. The lapped cars made it difficult for the leaders to get through since many were racing two and sometimes three wide and were not about to make it easy for the leaders to pass. A caution on lap 140 brought all the cars to the pits as Leighton and Hoar returned to the track in the first two positions. When Eddie returned after making adjustments and taking on four tires, the New England Mechanical Overlay/Grimm Construction Pontiac was behind the lapped cars of Patrick Laperle, Nick Sweet, and Don Wentworth as these three cars hounded the top three cars over the final 100 laps. Leighton, Hoar, and MacDonald had to contend with the slower lapped cars but the three mentioned above gave the leaders everything they could handle. At one point Eddie passed Hoar for second place but he was also passed by two of the lapped cars. It was very strange indeed. Eddie and Hoar continued to swap second place position as Leighton had a comfortable lead but the man on the move was Oxford regular Corey Morgan. After getting a lap back on the lap 142-caution, Morgan just flew through the field and was running in third while gaining on the #17. Hoar’s gamble to take two tires on the lap 140 caution did not turn out as planned as he lost positions to Brent Dragon and Martin and was running fifth before making a charge at the end to finish second. Who Came Through in The Clutch This Time? 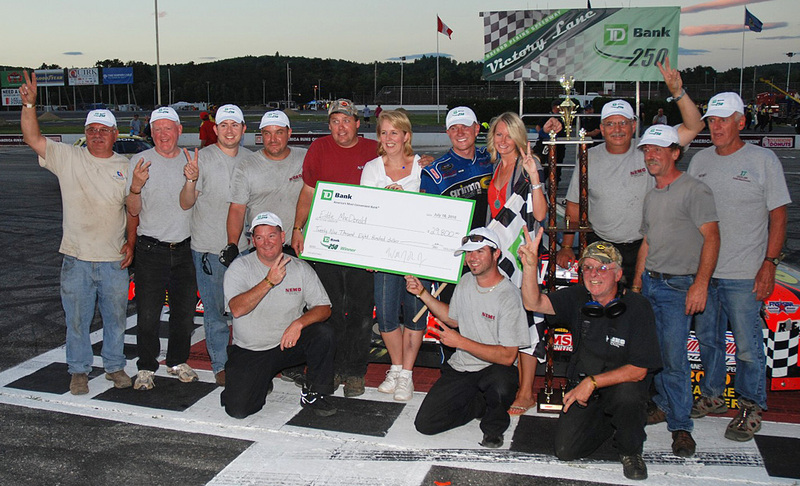 Eddie returned to the TD Bank 250 as the defending champion. 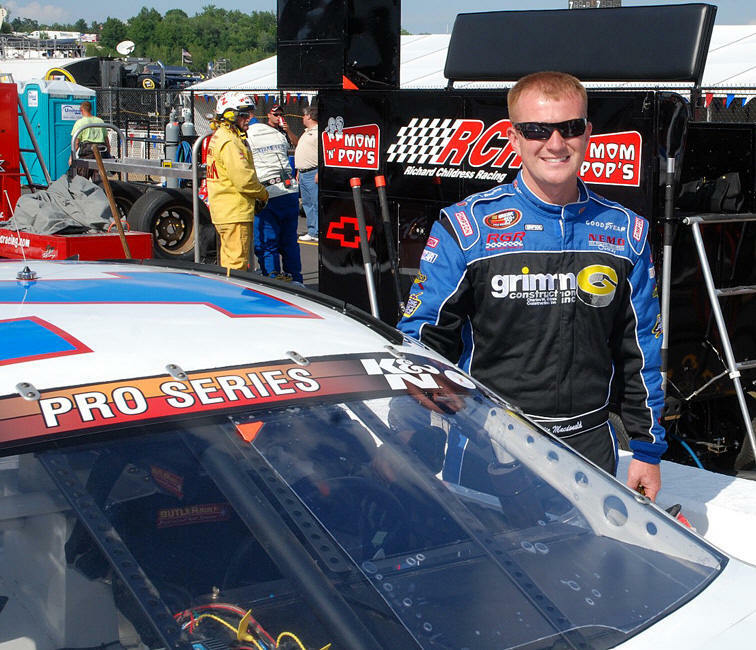 Eddie MacDonald matched his two best finishes in the K&N Pro Series East this season with a seventh place run in the Grimm Construction Chevy in the K&N 100. After starting 13th on the grid for the 66 lap event over the road course at Lime Rock, MacDonald moved steadily ahead to post his fourth top ten finish. When the green flag waved, MacDonald gained five positions by lap seven before pitting for gas. “Our strategy was to come in early and then recycle our way back to the front when all the leaders came in to pit. At the halfway flag we were running in 12th and looking to gain more positions. Unfortunately the brake issue really prevented us from getting into the top three. We were able to get to the top five and I hoped we could finish there,’ said the Rowley, Mass. veteran. Speed Channel will broadcast the Lime Rock Park race on Thursday, July 8. 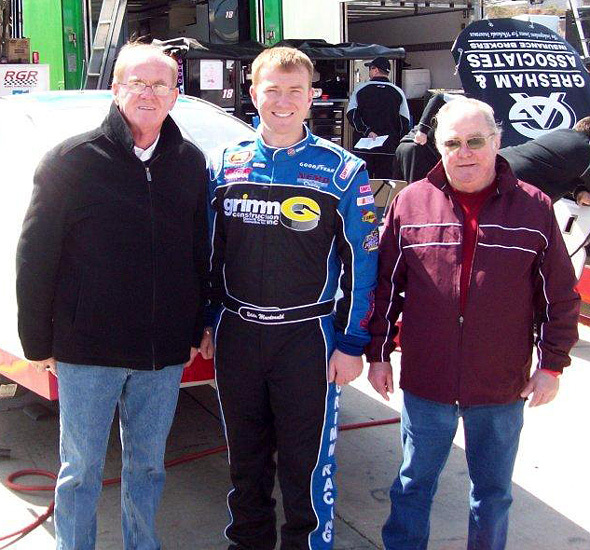 Eddie MacDonald came from 21st on the starting grid in the K&N Pro Series East New Hampshire 125 at NHMS to post a solid tenth place finish. The New England Mechanical Overlay sponsored Chevy did not have the typical qualifying run MacDonald and the Grimm Construction Racing Team has come to expect but the Rowley, Mass. veteran knew he had a fast car. MacDonald wasted little time charging to the front and by lap five the #71 was in the 13th position and took the ninth spot just as the caution flag on lap 17 waved putting him back in 11th. MacDonald picked up two positions on the restart but could not get around the #35 that was blocking all over the track and remained there until pitting on lap 83 for tires and fuel. Restarting in 12th, MacDonald moved into seventh on lap 103 and briefly held the sixth position as the caution flag waved again on lap 107. 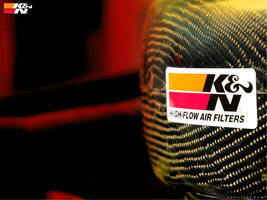 The K&N Pro Series East and the Whelen Modified Tour will both be in action on the road course of Lime Rock Park. Practice and Qualifying will take place on Friday with both races on Saturday, July 3. 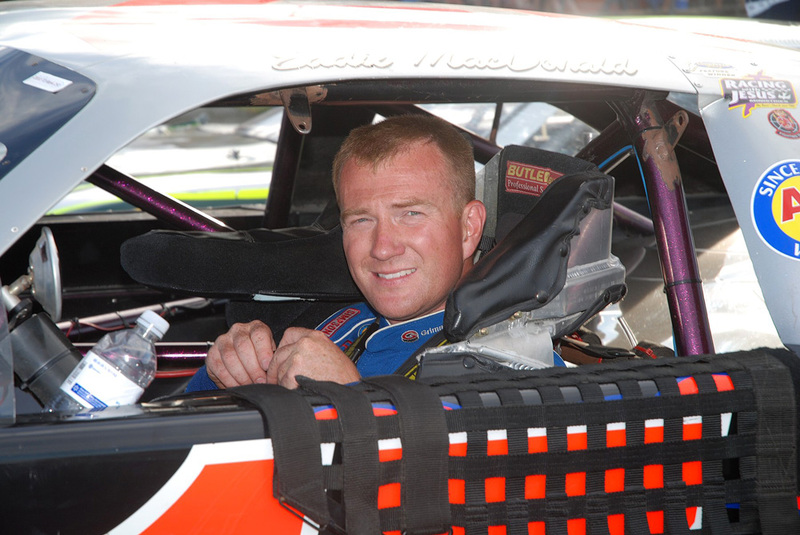 Eddie MacDonald has enjoyed great success at the “Magic Mile” with three victories in the last four K&N Pro Series East races and hopes the streak continues in the New England 125 on Friday, June 25. 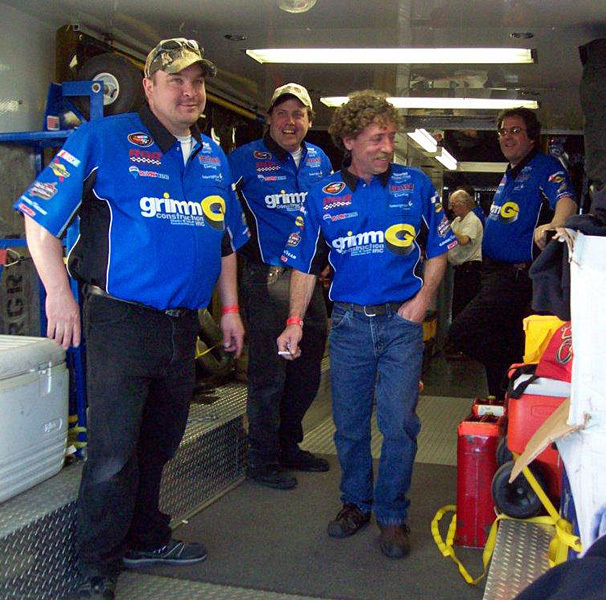 The Grimm Construction Chevy started on the pole and on the outside of the first row during that stretch. The New England 125 will take the green flag on Friday, June 25 at 5:00pm. Practice and qualifying are scheduled for Thursday. 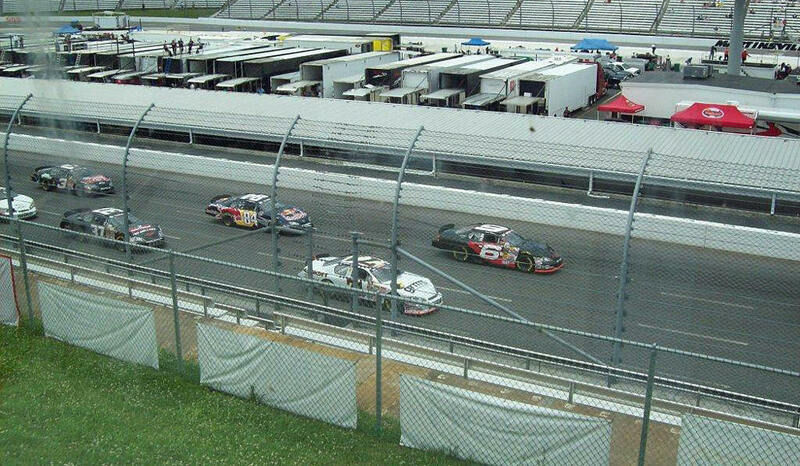 Eddie MacDonald qualified sixth in the UNOH 200 at Martinsville Speedway in the K&N Pro Series East race and rode to second place before blowing a right front tire. 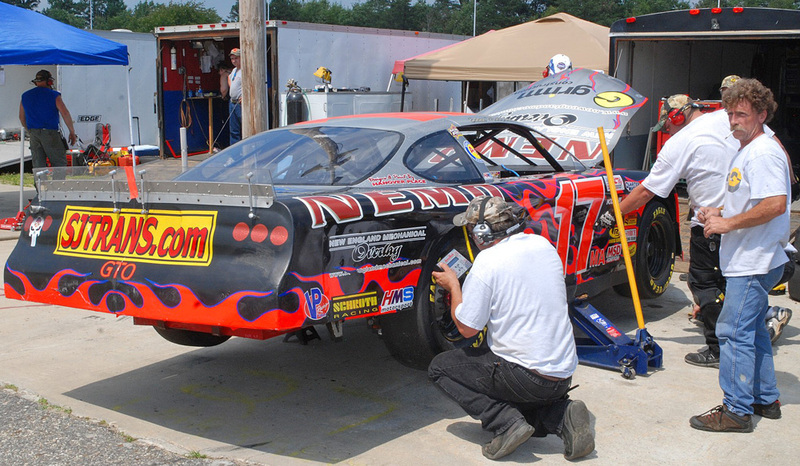 The front end damage forced the University of Northwestern Ohio sponsored ride to the pits for multiple adjustments resulting in a 27th place finish in the rain-shortened event. The Grimm Construction Chevy had a great qualifying run then started in fourth place when two cars in front were sent to the rear for unapproved changes. As soon as the green flag waved, MacDonald moved past the #4 car and into third place behind Ryan Gifford and Brett Moffitt. The top three cars were able to pull away from the rest of the field. A lap 32 caution flag bunched up the pack and on the restart Eddie made a power move to the inside past Moffitt for second place. After riding the Gifford’s bumper for a few laps, Macdonald settled into a steady pace behind the leader. 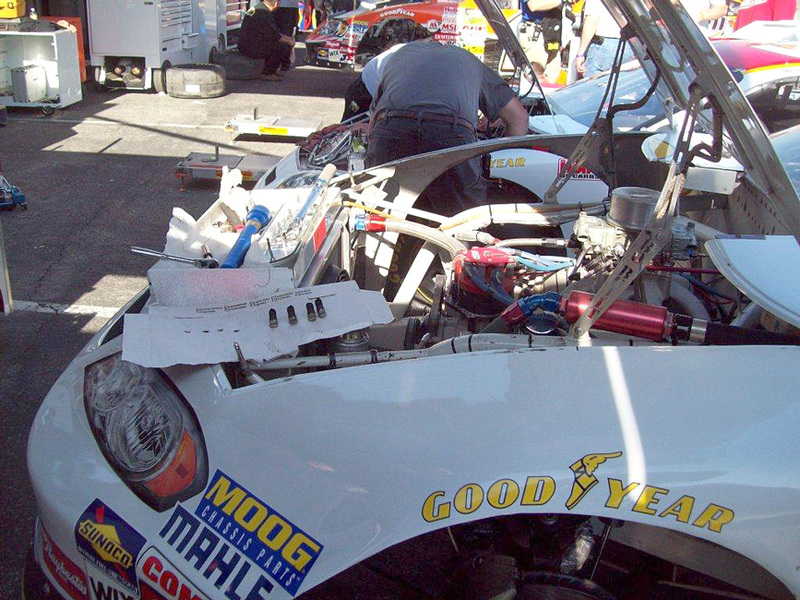 Crew chief Rollie LaChance warned MacDonald that a number of cars were experiencing right front tire trouble and to be aware. 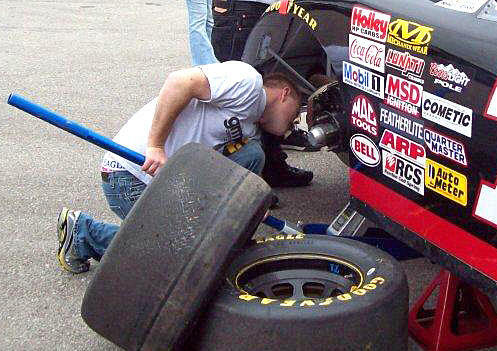 LaChance also readied the crew for any tire problems that may arise. As if prophetic, the tire blew on lap 56 and causing sway bar damage. 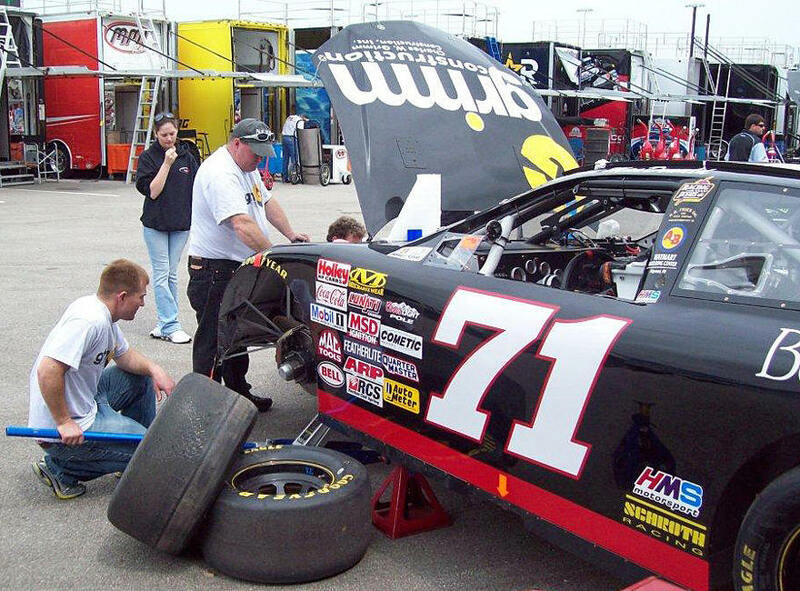 After returning to the track four laps down, the car suffered a rear tire failure forcing the #71 to the pits again. The crew worked to repair the damage to get MacDonald back on the track but was only able to complete 121 of the 175 laps before rain ended the event. “We were running so good it is just a shame that this had to happen. 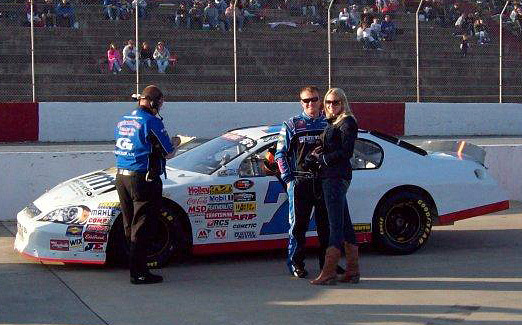 It was a lot of fun to race at Martinsville and I hope we get another shot at this place. We were hoping for a better show for our sponsor UNOH but that’s just racing sometimes. 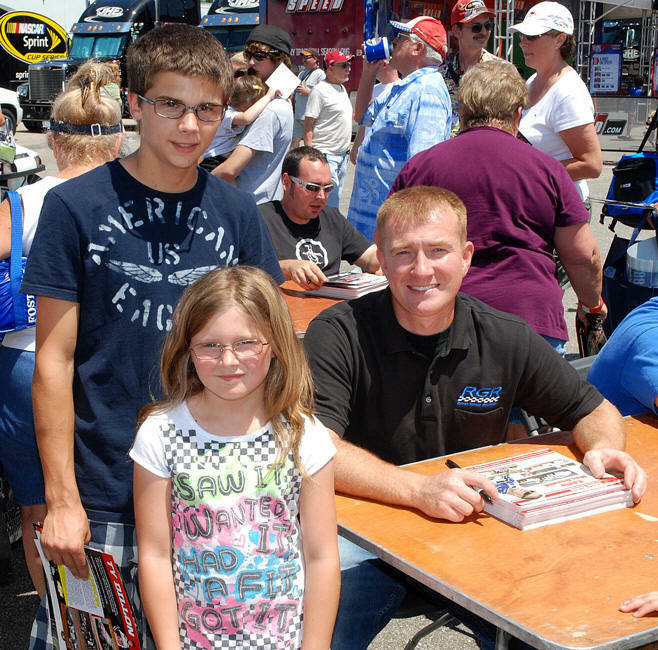 We will be ready for Loudon in a couple of weeks,” said the disappointed driver. - Eddie Qualified the UNOH/Grimm Construction Chevrolet in 6th. race was cut short by rain. 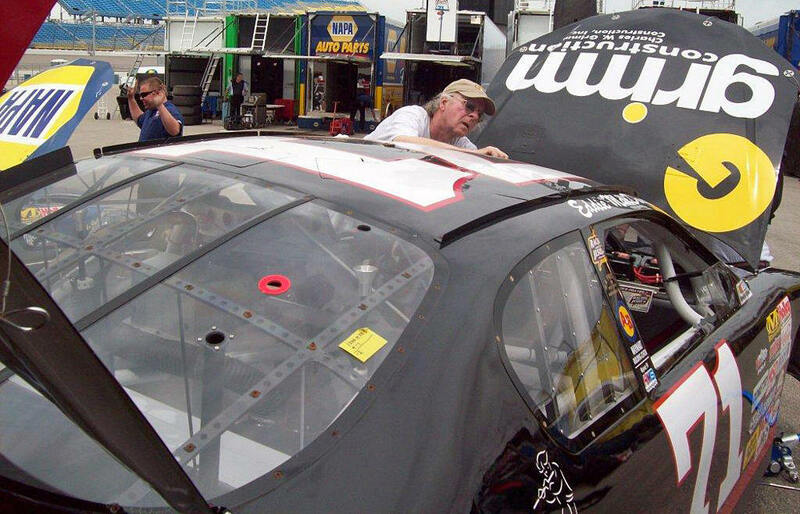 DAYTONA BEACH, Fla. – The fourth race of the 2010 NASCAR K&N Pro Series East season will take place at Martinsville (Va.) Speedway on Sunday, June 6 with the UNOH Performance 200. • Martinsville Speedway opened in 1947. 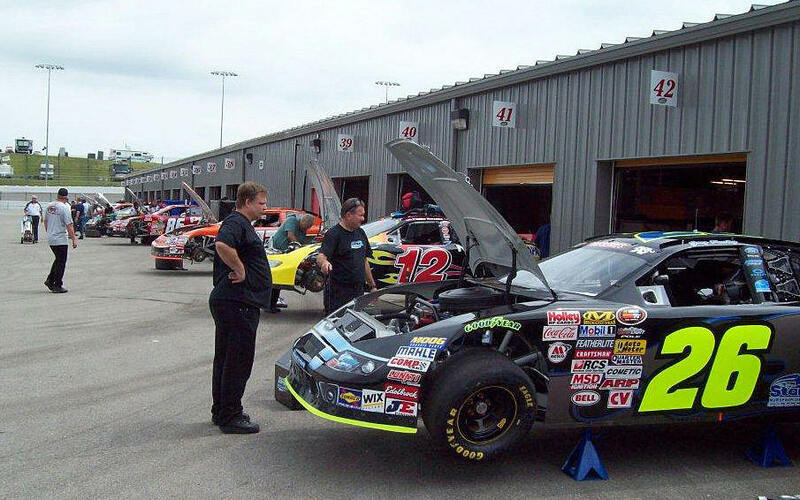 • There have been 123 NASCAR Sprint Cup Series, 34 NASCAR Nationwide Series, 23 NASCAR Camping World Truck Series, 34 NASCAR Whelen Modified Tour and five NASCAR Whelen Southern Modified Tour races at Martinsville. • This will be the inaugural stand-alone race for the NASCAR K&N Pro Series East at Martinsville. • The NKNPS East featured drivers that competed for their own series points in combination with the NNS in 1989 and 1990 at Martinsville. 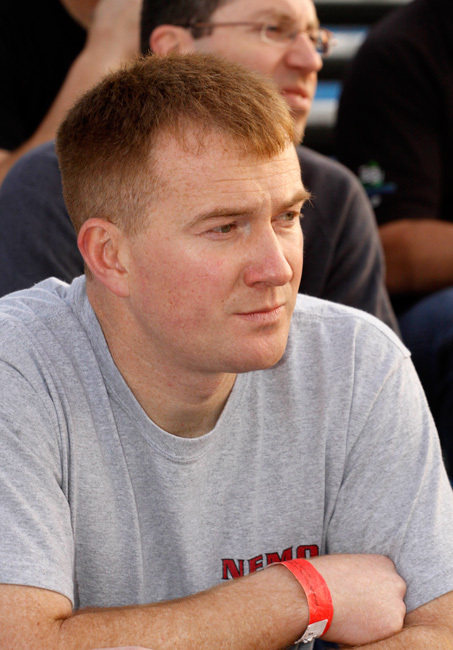 Eddie MacDonald will be wheeling the #71 UNOH, NASCAR K & N Pro Series Chevrolet in the Inaugural “UNOH Performance 200” at Martinsville on June 6th. 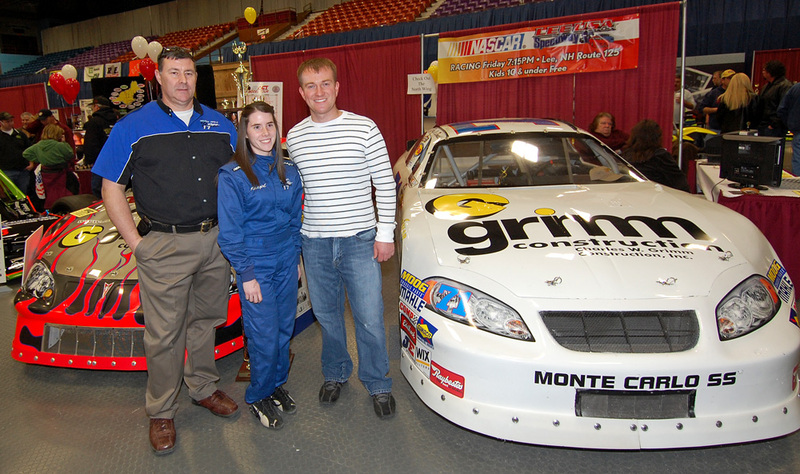 While new to the UNOH motorsports family, MacDonald is not a stranger to success on the race track. He finished the 2009 Camping World Series East campaign in 2nd place just 34 points behind Champion Ryan Truex. 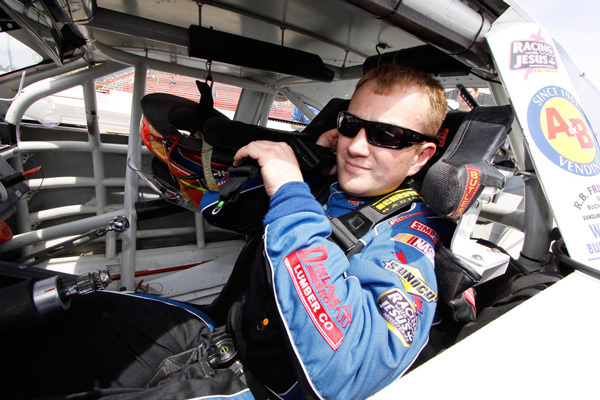 Todd Szegedy will be competing in the “UNOH Perfect Storm 150” at Bristol Motor Speedway on August 18th of this year as well as at Martinsville Speedway on June 6th in the “Whelen All American 150”. Szegedy is no stranger to UNOH. 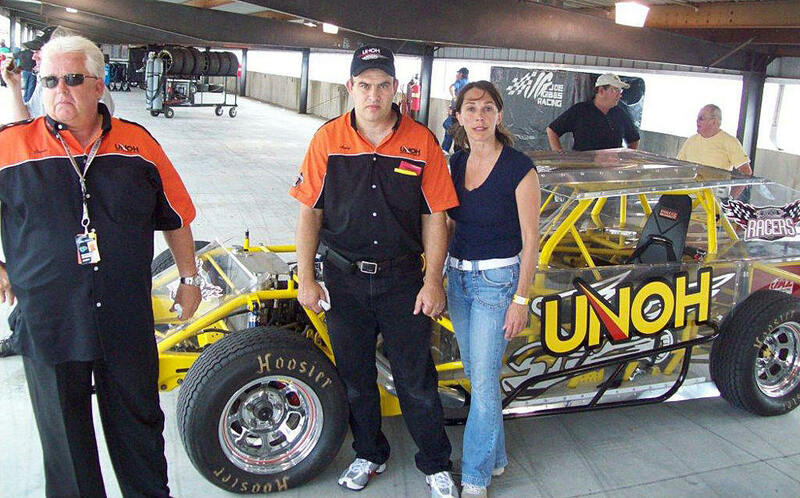 The 2003 NASCAR Whelen Modified National Champion piloted the #2 UNOH modified last year at New Hampshire Motor Speedway and at Bristol Motor Speedway for the inaugural “UNOH Perfect Storm 150”. 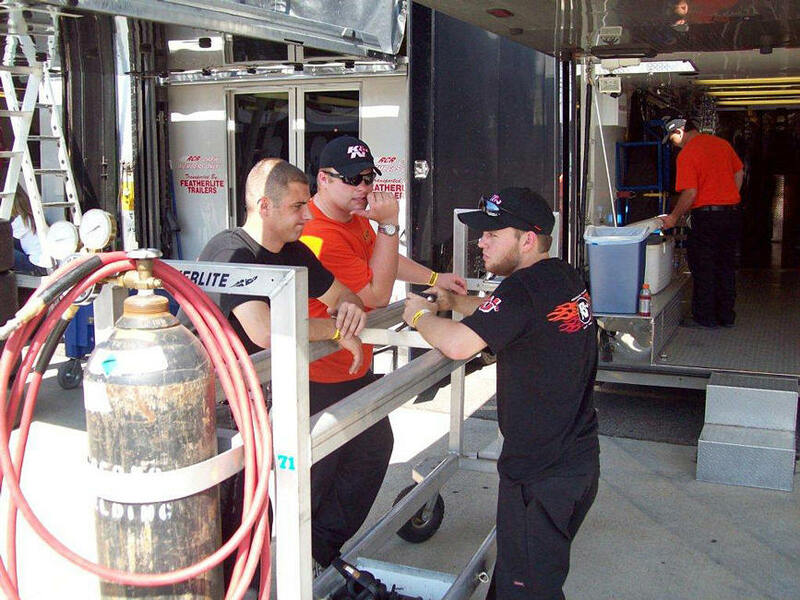 Eight UNOH Motorsports Team members, Kody Weisner, Ben Bowers, Cody Bland, Andy Mattord, Chris Puskas, Brandon Ziehl, Kevin Bradshaw and Sam Thomas, will be participating on the pit crews for both of these race teams in the NASCAR K & N Pro Series and Whelen Modified Series events. Eddie MacDonald posted a seventh place finish in the Goodyear Dealers of Iowa 200 at Iowa Speedway in the K&N Pro Series third race of the season. 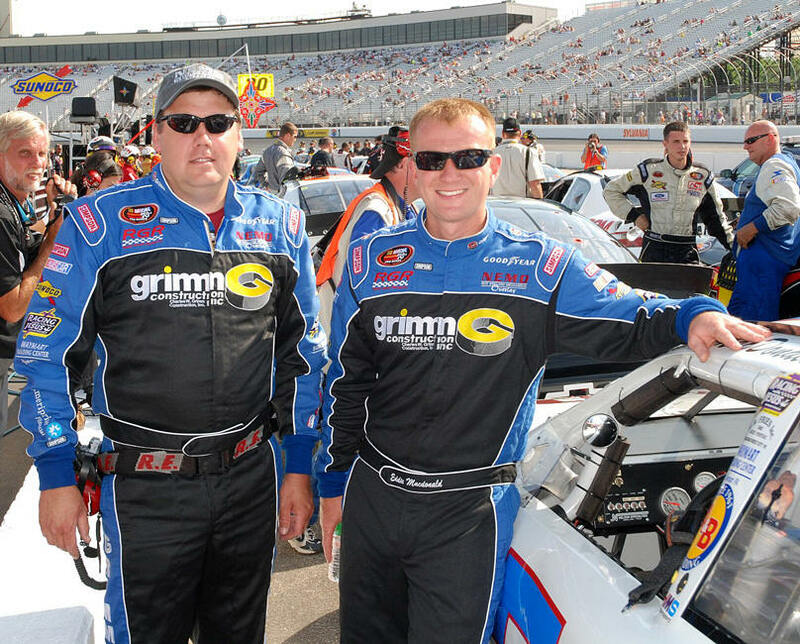 The Grimm Construction Chevy qualified fourth after scoring one of only five sub 24 second laps around the .875 mile oval. Forty-nine cars attempted to qualify for 44-car starting grid in the combination event pitting the East versus the West series’ drivers. MacDonald’s has crashed out of the two previous races at the track so this finish is well received. A caution on lap 129 saw all the leaders pit and the Grimm Chevy took on gas, right side tires and a wedge adjustment. With 60 laps to go MacDonald rode in thirteenth and in tenth by lap 160. 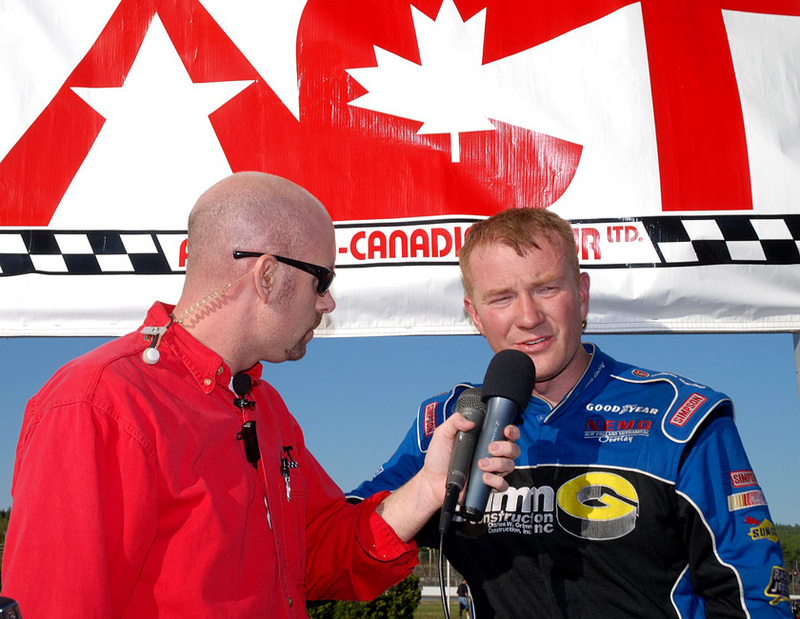 With the laps winding down and the leaders stretched out on the track MacDonald gained the final two positions to seventh before the GWC finish. Only one West car finished ahead of MacDonald but the team moved from tenth in the points and into eighth. 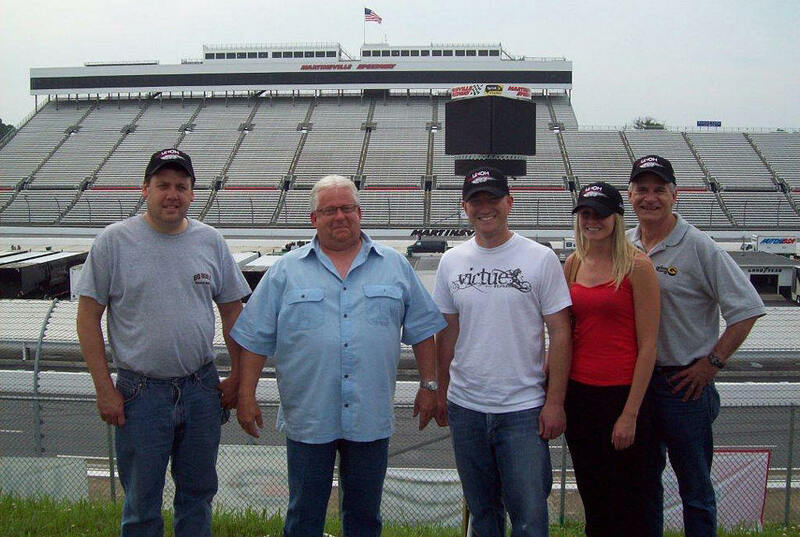 The K&N Pro Series East next race will be at Martinsville Speedway on June 6. Eddie MacDonald expects a better result as the Grimm Racing Team prepares for their third visit to Iowa Speedway in the K&N Pro Series East/West race. The Goodyear Dealers of Iowa 200 will pit drivers from the East and West series for 200 laps around the .875 mile oval designed by Rusty Wallace on Sunday, May 23. The Grimm Construction Chevy will take the green flag on Sunday with the live update provided on Neracing.com. Speed will provide video of the race on May 27 at 6pm. 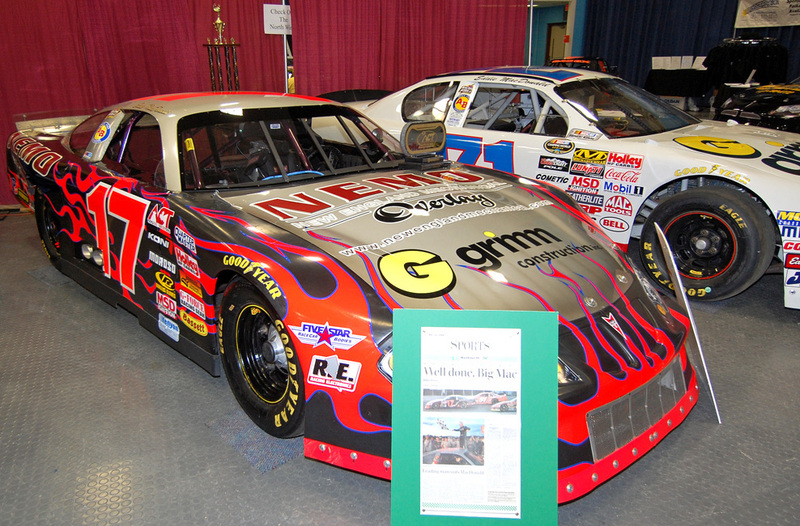 Tuesday, May 18, from 9 a.m. to 1 p.m., two UNOH sponsored NASCAR race teams will be on the University of Northwestern Ohio’s campus at the High Performance Motorsports 600 Building on Hartzler Road with their team haulers and race cars for students to view the cars, get driver autographs and photo opportunities. 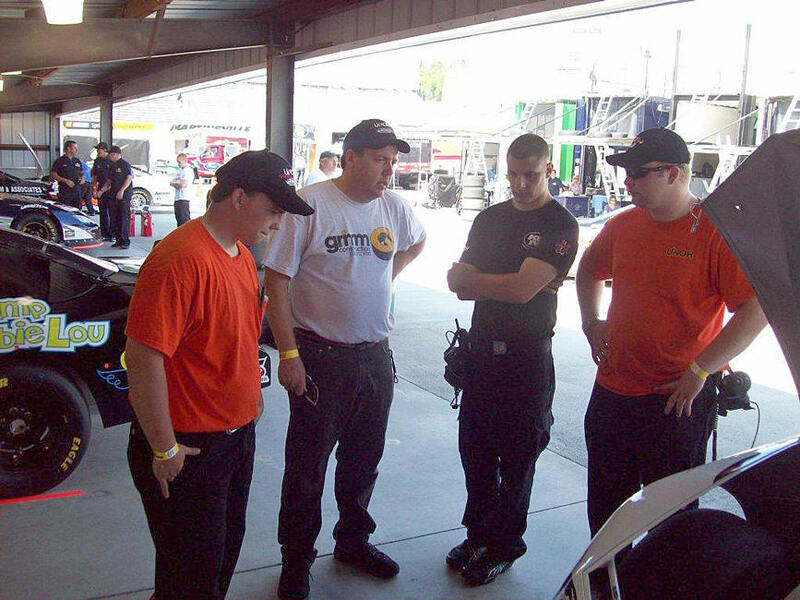 Todd Szegedy, driver of the # 2 UNOH – Wisk – Snuggles, NASCAR Whelen Modified, and Eddie MacDonald, driver of the #71 UNOH – Grimm Racing, NASCAR, K & N Pro Series Chevrolet, will be available for all UNOH employees, students and the public. Also on hand will be the actual pace car from Martinsville Speedway along with marketing representatives from both Bristol and Martinsville tracks with handouts for the staff and students. Last but not least, a NASCAR PR representative will be on hand to answer questions for students, staff and the public about the series and NASCAR in general. The best time for media to do interviews and get video and pictures is around 11 AM. 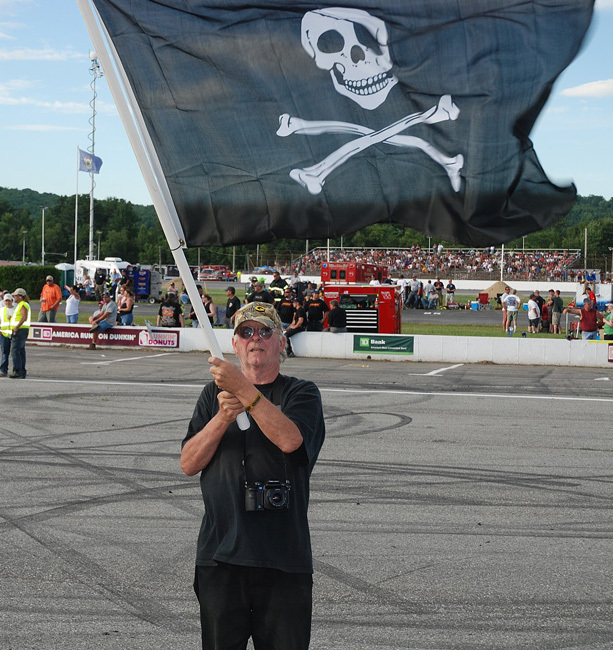 ACT PR - Eddie MacDonald of Rowley, MA took the checkered flag in the American-Canadian Tour 150 at Oxford Plains Speedway in Oxford, ME. MacDonald started in the fifth starting position and would take the lead on a lap 54 restart. 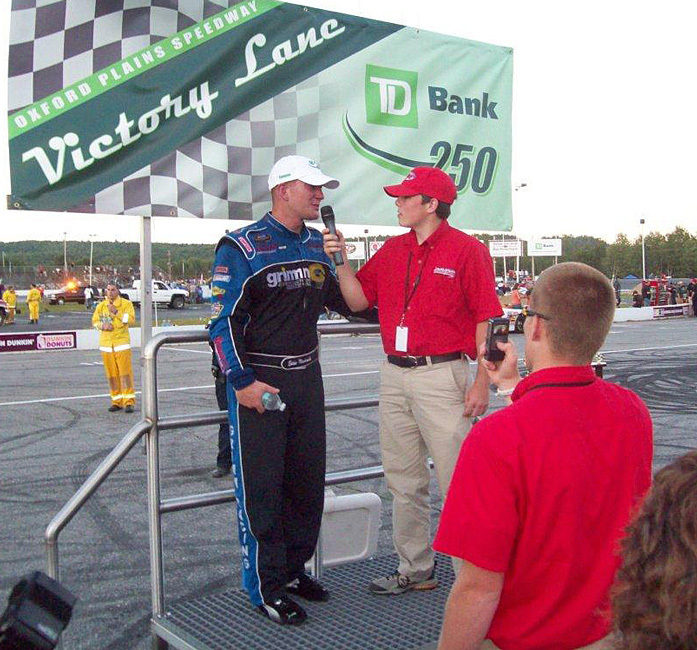 The 2009 Oxford 250 and ACT Invitational at New Hampshire Motor Speedway winner would lead the remainder of the race but not without pressure from hometown favorite Tommy Ricker of Poland, ME. Ricker got to the rear bumper of MacDonald several times in the final laps but didn’t have enough to get by while the two worked their way through lap traffic. 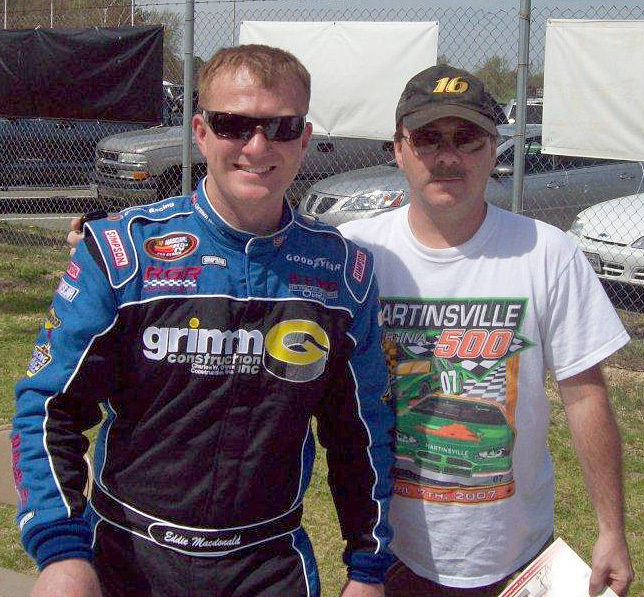 The 2009 ACT Late Model Tour Champion Brian Hoar took third after leading the first 25 laps. 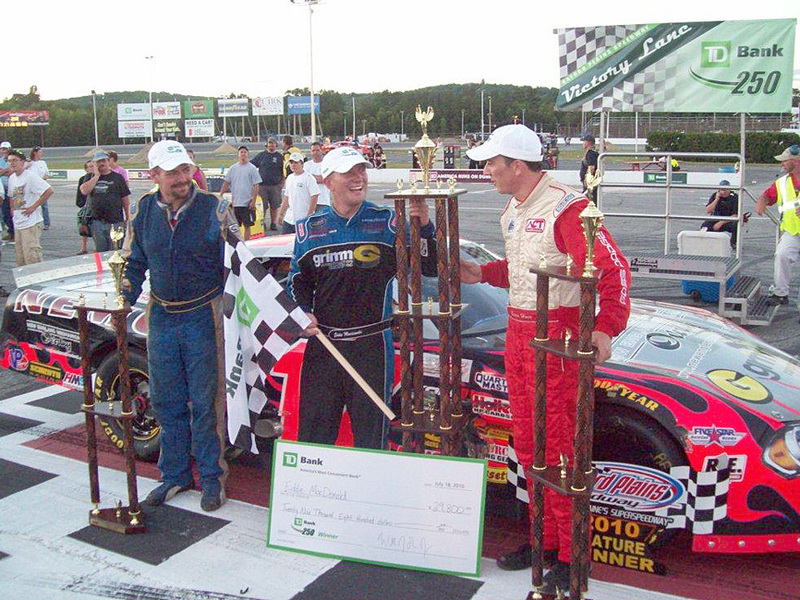 MacDonald’s only other ACT Late Model Tour win also came at Oxford Plains Speedway in August of 2007. John Donahue made a late race charge from his 31st starting position to finish fourth followed by Tim Brackett rounding out the top 5. Travis Adams, Scott Payea, Brent Dragon, Jeff White and TJ Brackett rounded out the top ten. The 150 lap event was completed in just over 52 minutes and was slowed by just one caution on lap 54. With his win in the second event of the 2010 ACT Tour schedule. MacDonald joins opening day winner Nick Sweet as the first two qualifiers for the ACT Invitational at New Hampshire Motor Speedway that will be held on Saturday, September 18. 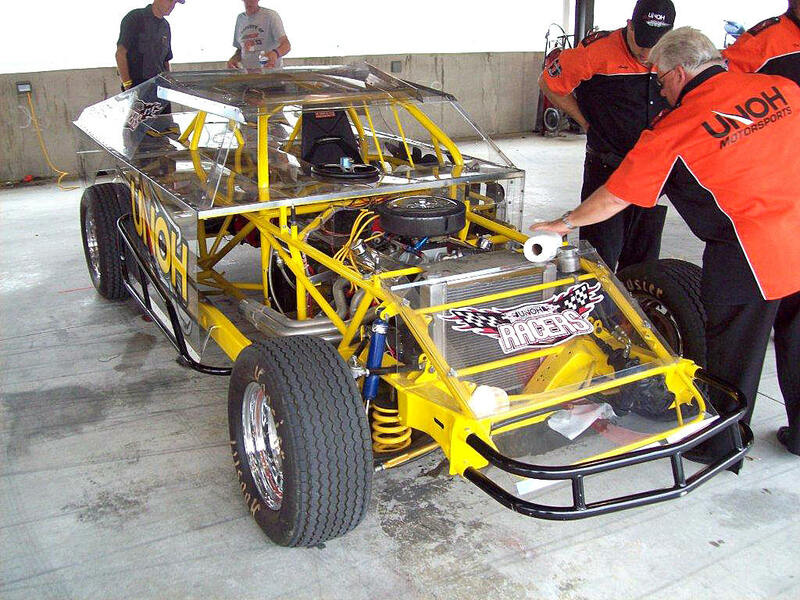 Eddie and Rollie LaChance will participate in this weekend’s American Canadian Tour race scheduled for 150 laps at the famed Oxford Plains Speedway; a track the pair has achieved great success through the years. 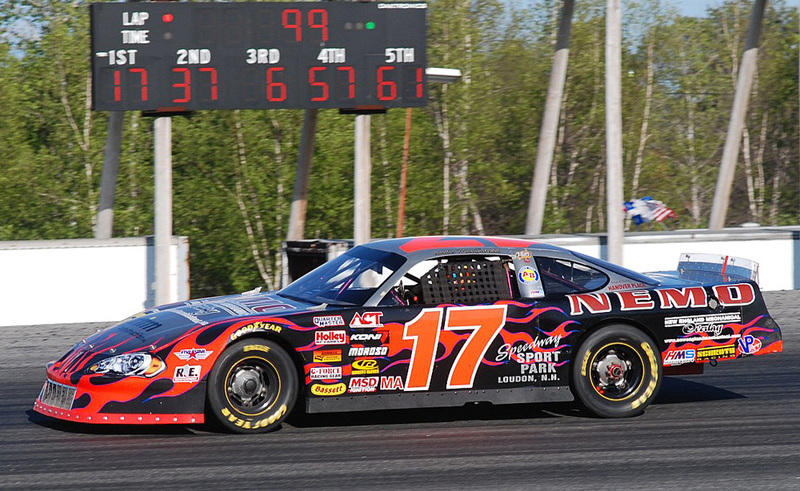 This will be the first outing for the #17 Late Model that won both the Oxford 250 and the ACT Invitational at New Hampshire Motor Speedway last season. Both Eddie and Rollie have a history of running well at the Maine track, not only posting the incredible 250 win but also winning numerous times in the past. 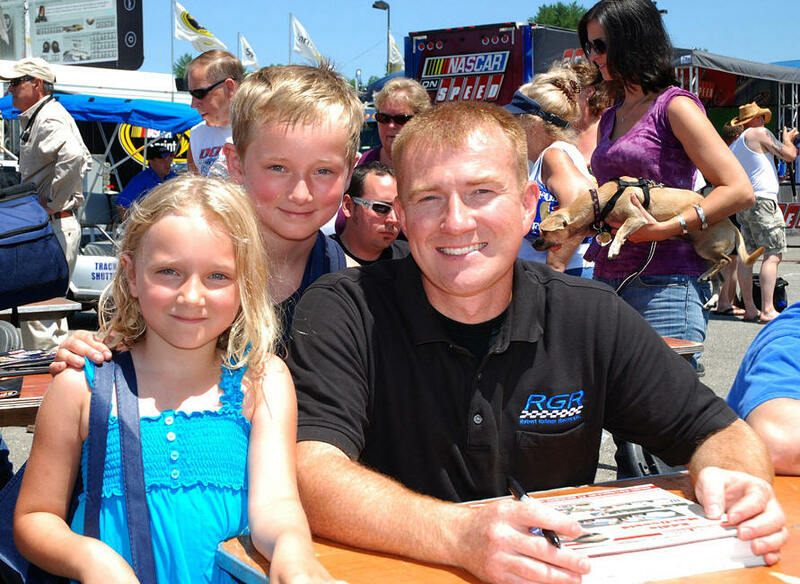 Rollie began his racing career at Oxford that is just a few miles from his childhood home and despite all the wins throughout his career there the 250 win had evaded his grasp until last year. 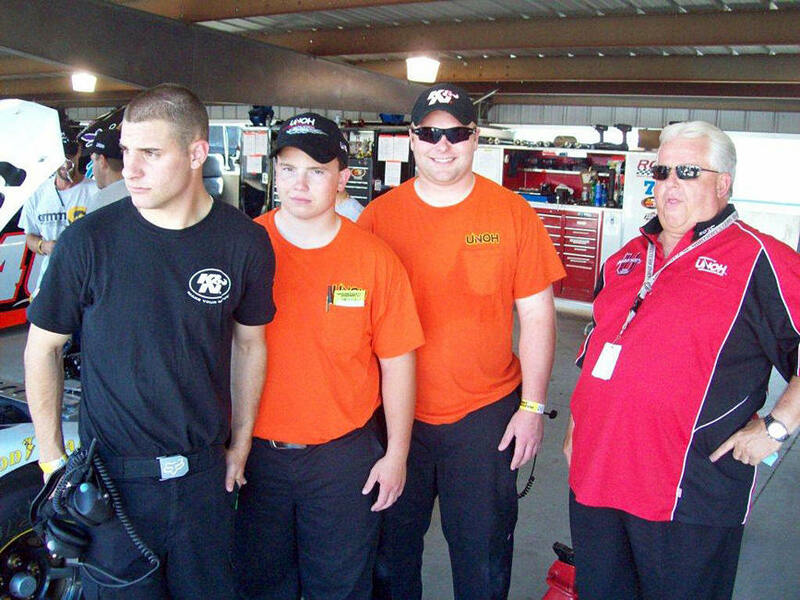 Rollie’s goals for the team, both Late Model and ACT Tour, were to win at Loudon and at Oxford. 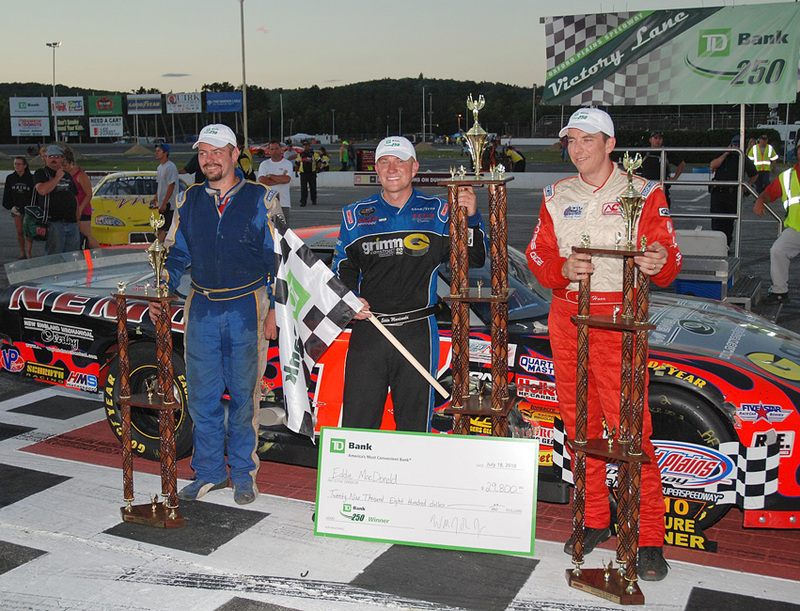 The East team has won three races in the last two seasons at the Magic Mille, coupled win the first-ever Act race held at NHMS in September, so both driver and crew chief would like nothing better that to add another Oxford 250 title to the list. The New England Dodge Dealers 150 is slated to begin qualifying heats at 2:00 with a last chance consolation race to follow. All of Oxford’s divisions are scheduled to compete in the speedway’s opening day racing card. 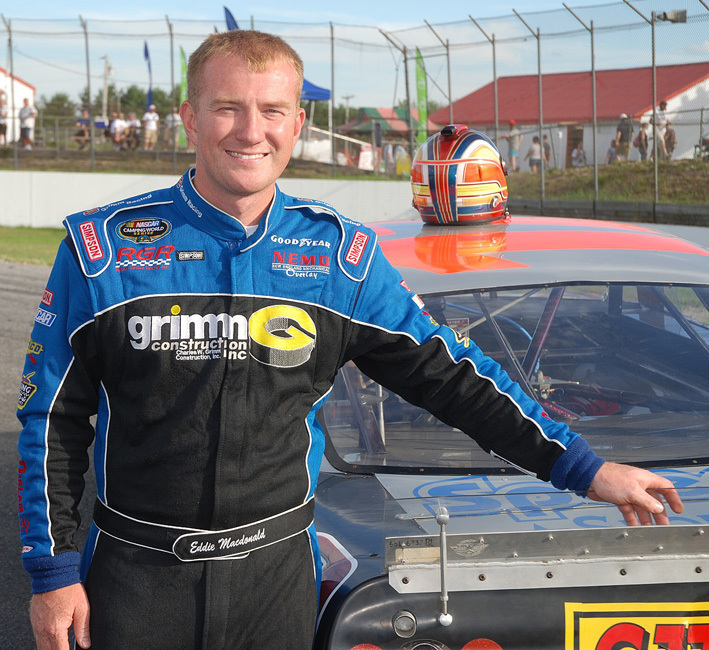 (South Boston Speedway, April 3) Eddie MacDonald raced to a seventh place finish in the K&N Pro Series East in the South Boston 150 in Virginia in the Grimm Construction Chevy this past Saturday at the famed half-mile. The Rowley, Mass. driver qualified in the eleventh position and rode in fifth and sixth for much of the race before losing a spot on the final lap. After last week’s disappointing 16th place run at Greenville Pickens MacDonald feels the team is headed in the right direction but needs to improve. 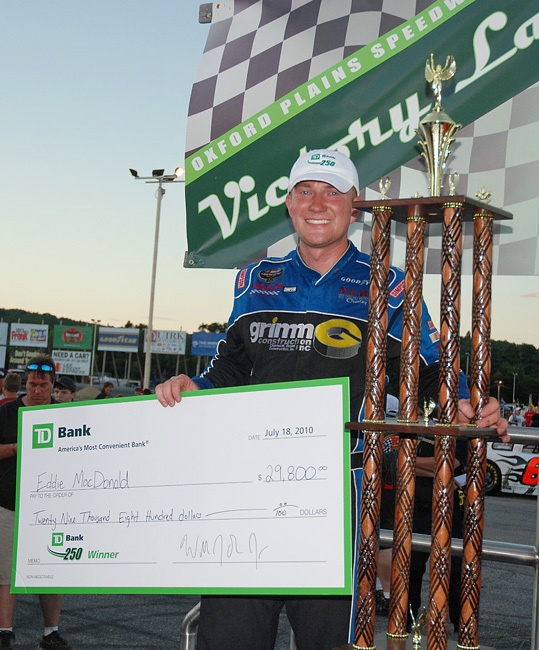 Eddie MacDonald qualified sixth in the opening event for the K&N Pro East Series race in the Kevin Whitaker Chevrolet 150 at the famed speedway but an early race incident upset the handling of the Grimm Construction Chevy. 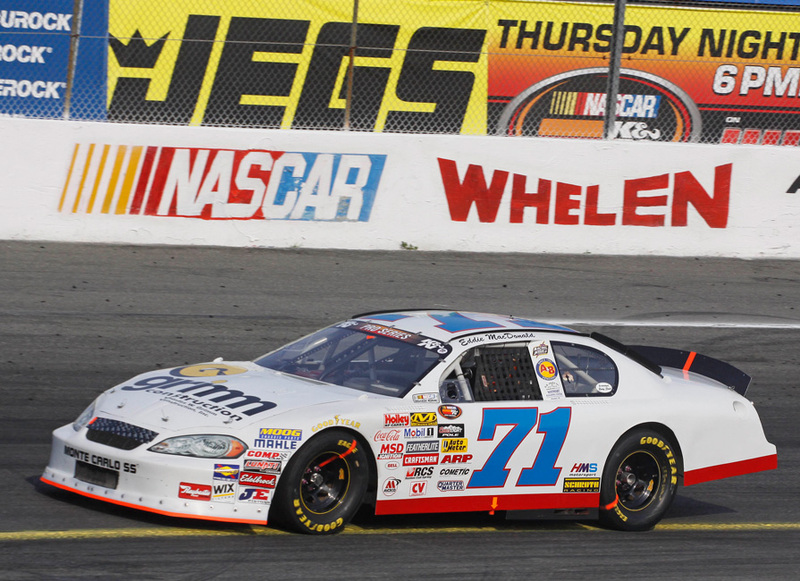 The eventual flat tire resulted in a seventeenth finish for the veteran Rowley, Mass. driver. MacDonald maintained his position despite the tire issue. With only 50 laps to go MacDonald was running in the top ten but the handling was quickly becoming an issue. On lap 119 MacDonald radioed Rollie (LaChance) that the tire was definitely going down and by the lap 127-caution the tire finally blew out. “It was one of those things that if I pitted earlier and it wasn’t the tire going down then I made a big mistake that cost us positions. However If I waited to see and it went then I would have made the wrong decision. It was just one of those things that whatever I did it was going to turn out wrong,” said the dejected veteran driver. 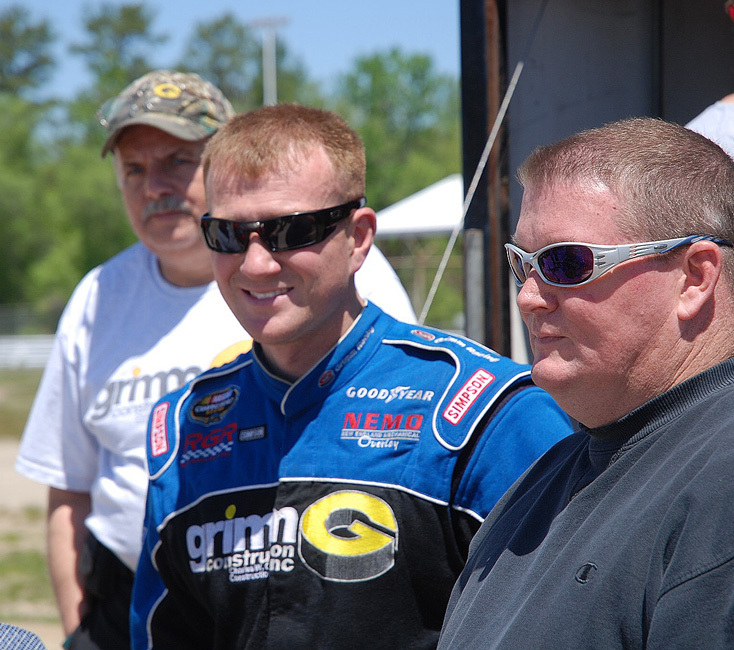 With the start of the season at Greenville-Pickens Speedway only days away, Eddie MacDonald and the Grimm Racing Team are ready to improve on last year’s second place finish in the championship chase. The team has been busy at work preparing the cars for the challenging ten race schedule and hopes to jump out of the gate with a big win. 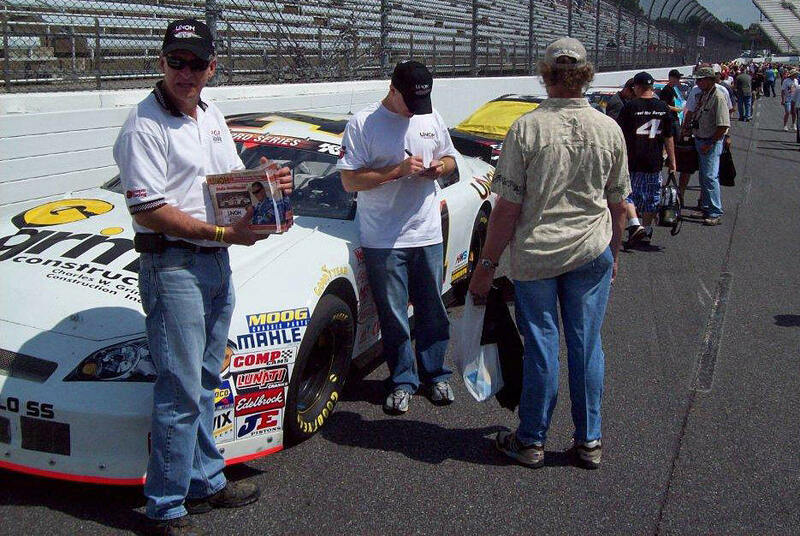 In the fall of 1997, Dale Earnhardt and I had a closed-door conversation with an executive of our NASCAR Busch Series team's primary sponsor. 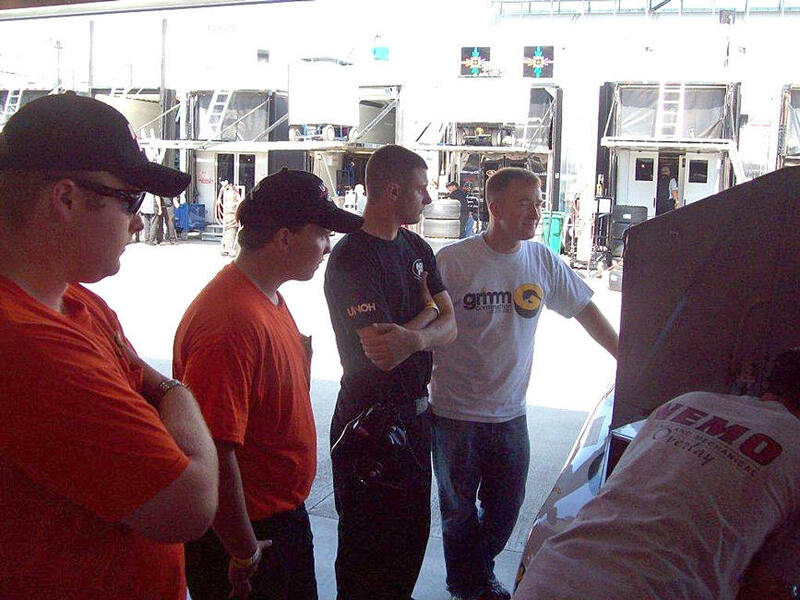 We were informing this distinguished gentleman that we planned to move Steve Park to the Cup Series the following year and were replacing him with an unproven driver, Dale Earnhardt Jr. The expanded calendar includes 21 events on SPEED for the NASCAR K&N Pro Series and seven races for the NASCAR Whelen Modified Tour and NASCAR Whelen Southern Modified Tour. This comprehensive package includes airing of every race on the NASCAR K&N Pro Series East and West schedules. 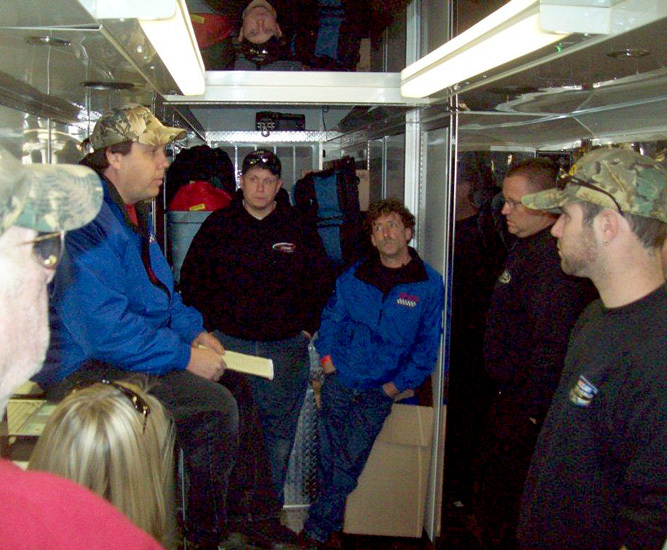 Three of the Whelen Modified Tours will air as same-day televised events. SPEED, anchored by its popular and wide-ranging coverage of NASCAR, is the nation’s first and only cable television network dedicated to automotive and motorcycle racing, performance and lifestyle. 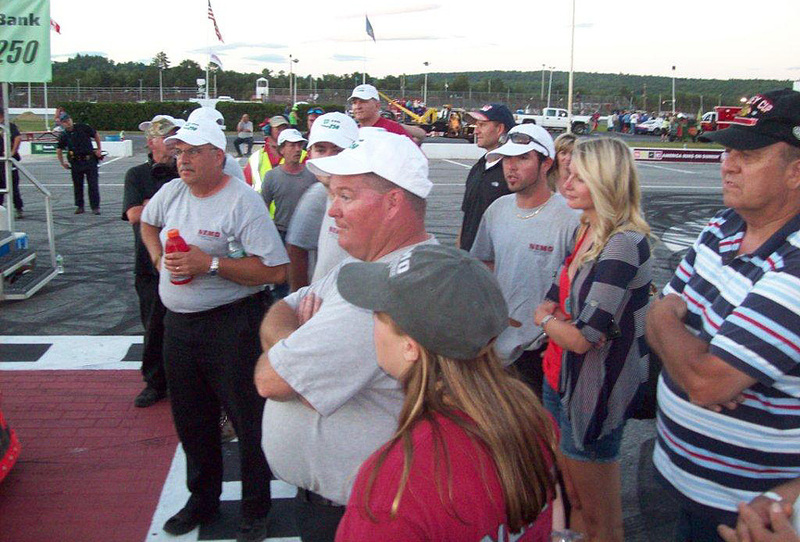 The NASCAR Developmental Series programming will air Thursdays at 6 p.m. ET. SPEED, in conjunction with NASCAR Media Group, will air each tape-delayed race as a one-hour show. SPEED will once again provide same-day coverage of the combination event between the NASCAR Whelen Modified Tour and Whelen Southern Modified Tour at Bristol Motor Speedway on Wednesday, Aug. 18, as well as the NASCAR Whelen Modified Tour race at New Hampshire Motor Speedway on Saturday, Sept. 18 and the NASCAR Whelen Southern Modified Tour finale at Charlotte Motor Speedway on Thursday, Oct. 14. SPEED’s coverage will begin with the NASCAR K&N Pro Series East opener at Greenville-Pickens (S.C.) Speedway (race date is March 27; air date is April 1) and conclude with the NASCAR K&N Pro Series West finale from Phoenix International Raceway (race date is Nov. 11; air date is Nov. 18). The schedule includes seven re-airs of previous events during select Thursday slots throughout the season for a total of 34 events. In addition, NASCAR will expand its relationship with the sports cable television network Versus to include coverage of the NASCAR Developmental Series. 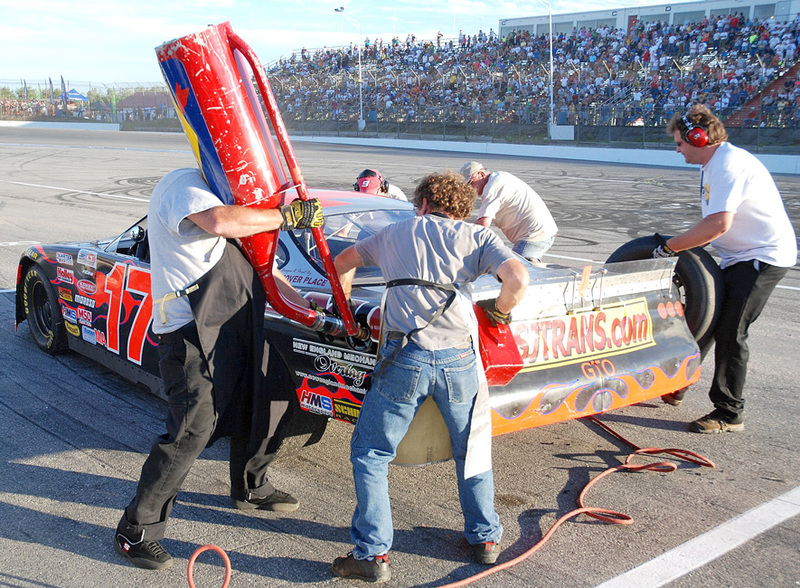 It will air an additional nine events from the NASCAR Whelen Modified Tour and NASCAR Whelen Southern Modified Tour. For the fourth season, TSN will again provide season-long coverage of the NASCAR Canadian Tire Series presented by Mobil 1. The Versus and TSN programming schedules are currently being finalized and details will be announced shortly. 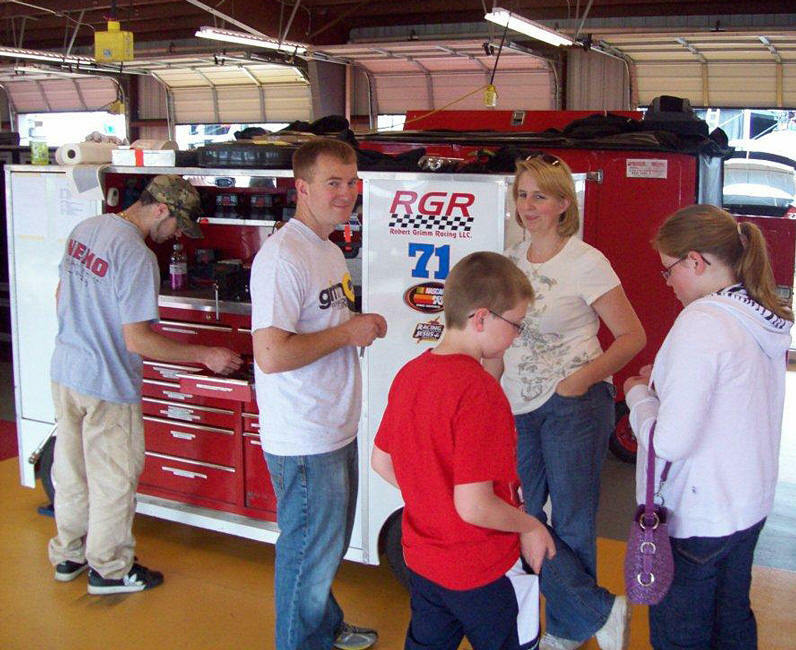 The 2010 season will be highlighted by three companion events with the NASCAR Sprint Cup Series. 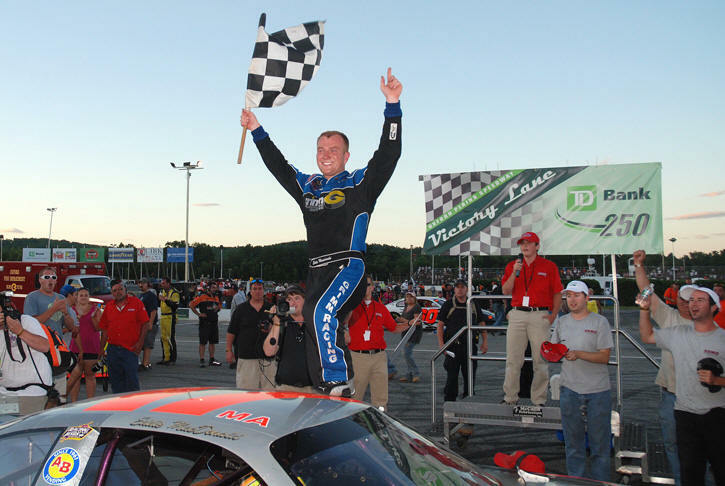 New Hampshire Motor Speedway will have its traditional events on June 25 and Sept. 17 in Loudon, N.H., while the champion will once again be crowned at Dover (Del.) 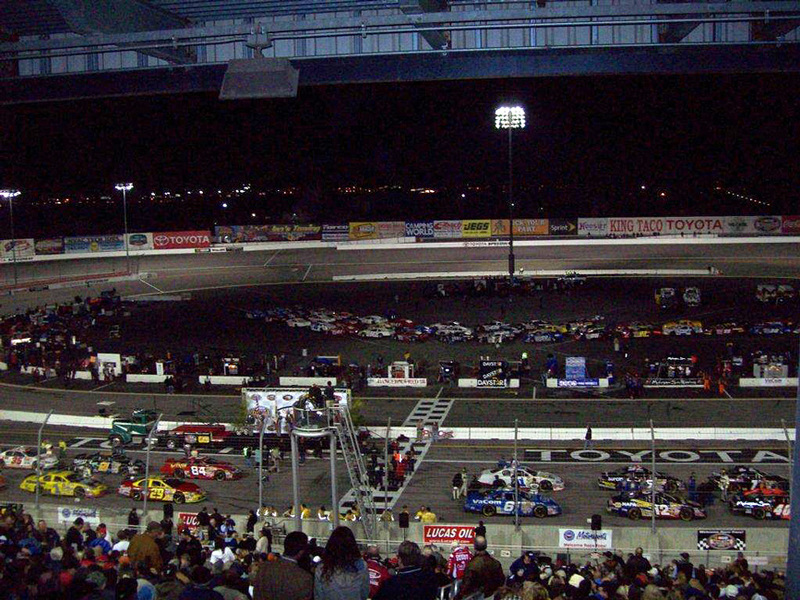 International Speedway on Sept. 24. 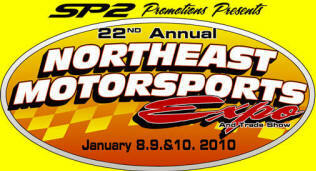 New to the K&N Pro Series East schedule in 2010 will be the high-banked half mile of Gresham Motorsports Park. The Jefferson, Ga., track is on the schedule for Aug. 28. 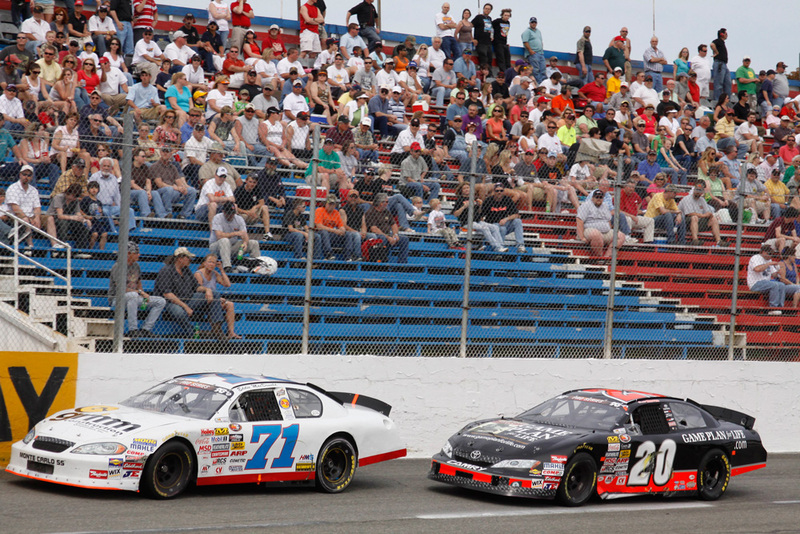 A pair of familiar venues will also return to the K&N Pro Series East schedule in 2010. 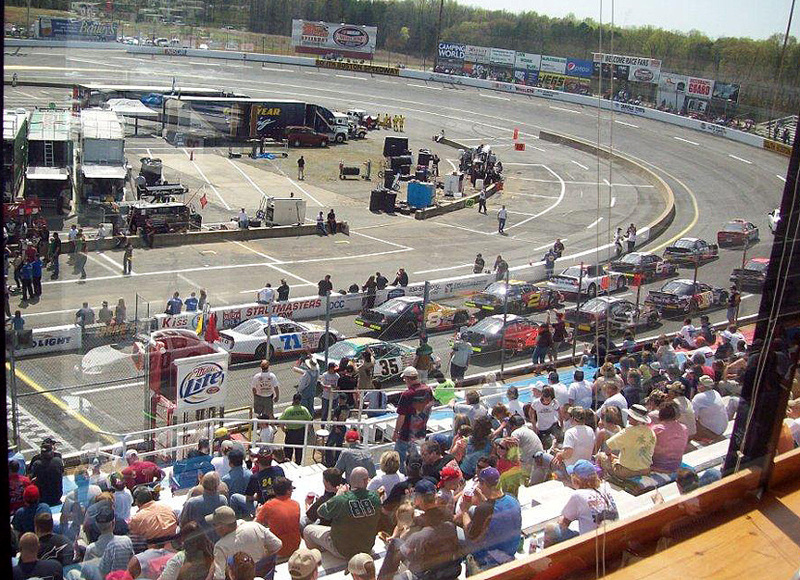 Historic Martinsville (Va.) Speedway played host to the NASCAR Nationwide and K&N Pro Series East – then known as the Busch and Busch North Series – for combination races in 1989 and 1990, and a return engagement is slated for June 6. 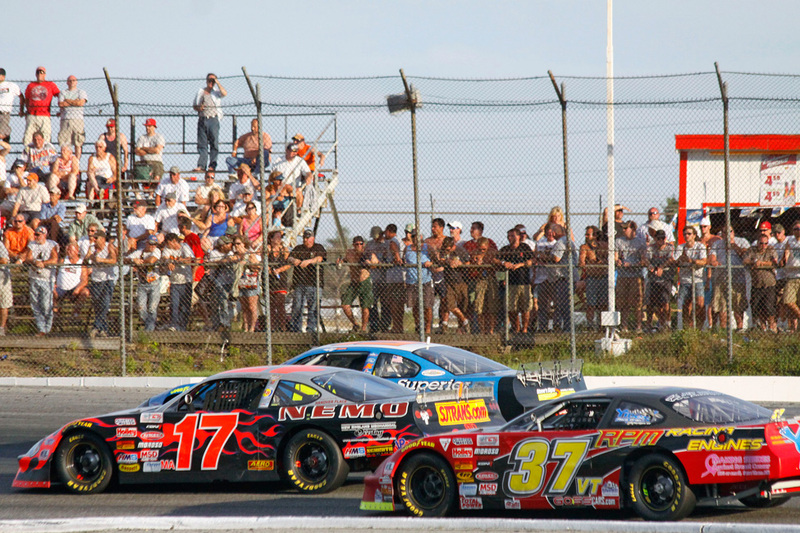 And after a five-year absence, Lee USA Speedway will welcome back the East for a date on July 30. 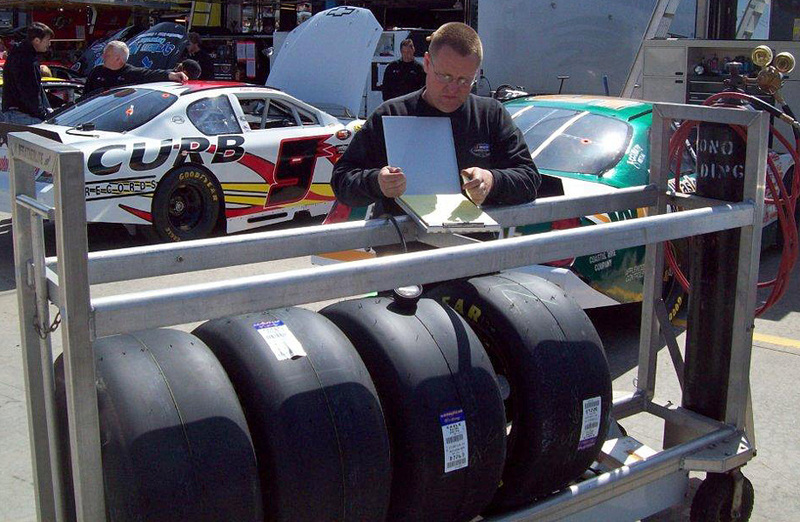 The .375-mile oval was the site of 16 K&N Pro Series East from 1992-2004. 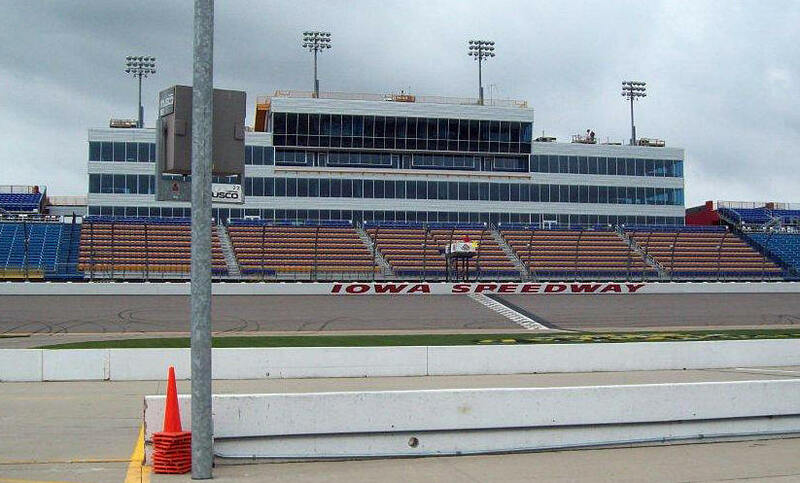 The K&N Pro Series East and West will converge on Iowa Speedway for the fourth year in a row for the prestigious combination race on May 23 in Newton, Iowa. The first three editions of the event have attracted also NASCAR Sprint Cup Series standouts Kevin Harvick, Kasey Kahne and Kyle Busch. 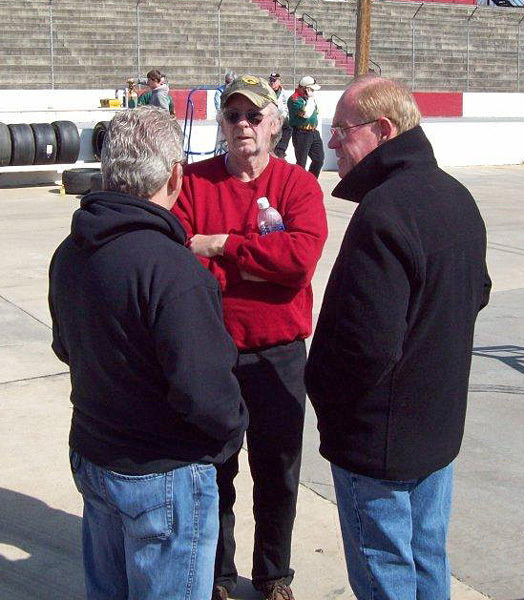 • The 24th season of the K&N Pro Series East will commence at Greenville (S.C.) Pickens Speedway on March 27, two weeks earlier than last year. 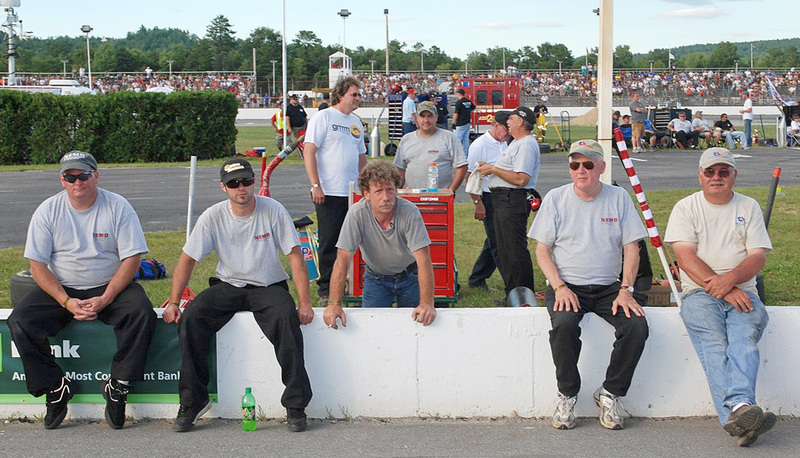 It will mark the fifth season in a row the half-mile track has played host to the East. 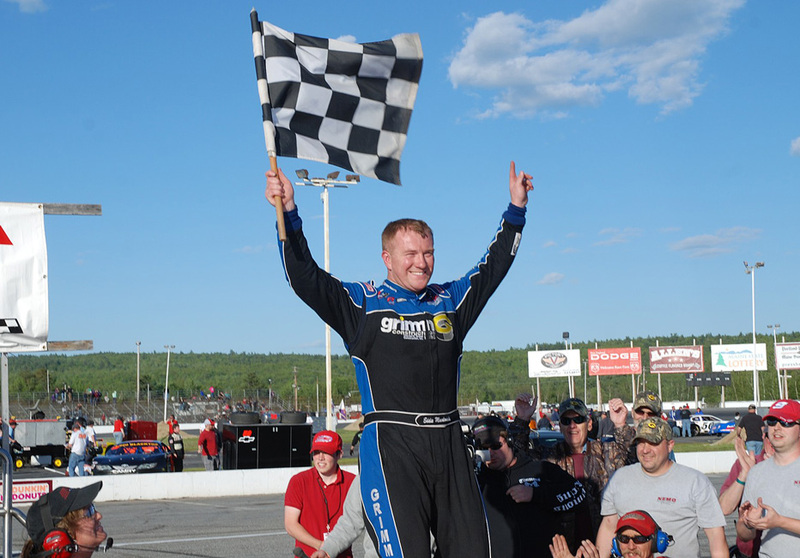 • April 3 will see South Boston (Va.) Speedway bring the K&N Pro Series East in for a doubleheader with the NASCAR Whelen Southern Modified Tour. The venerable .4-mile oval has held East races since 2007. This will be the earliest that South Boston has been on the calendar. • The 1.53-mile road course at Lime Rock Park in Lakeville, Conn., will return to the schedule on July 3 for the 18th time since 1993. The race had been run in mid-August the two previous seasons. 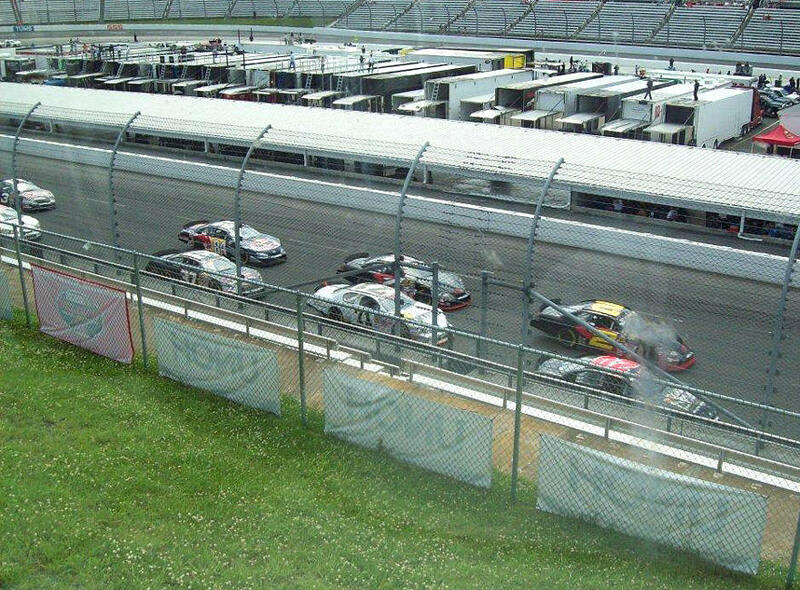 • The Martinsville and Lime Rock races will be doubleheaders with the NASCAR Whelen Modified Tour. 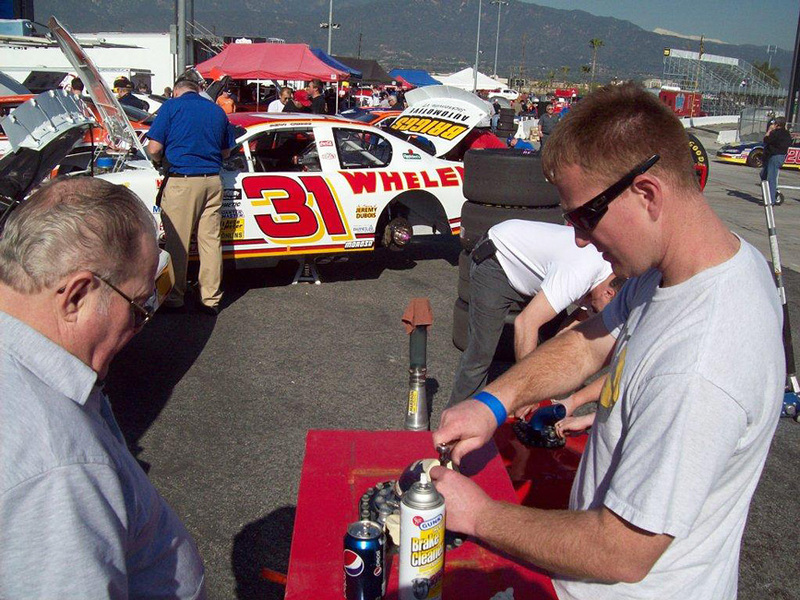 Eddie MacDonald participated in the 11th Annual Busch Sport Scene Ride for Charity on February 6th, just one week after earning a top ten finish in the NASCAR Toyota All Star Showdown in Irwindale, California. Eddie made the trek to Rangeley, ME to support the annual charity event that has raised over $100,000 in the past eleven years. The event has also become the occasion to announce the Busch Sport Scene annual awards. 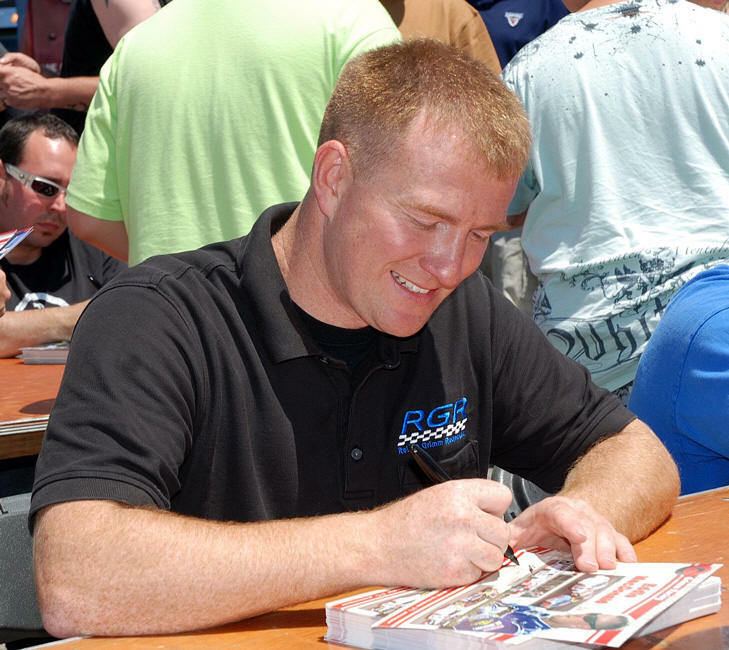 Busch Sport Scene publisher George Campbell announced the magazine's Driver of the Year and Fans Favorite award winners for the 2009 season. Eddie was honored as the winner of both awards this year, becoming one of the few to have ever won both awards in one year. The Driver of the Year award is chosen by the Busch Sport Scene staff members. Staff members are asked to nominate their top three choices for the award, in order of first to third. The first place driver receives three points, the second place driver earns two points while the third place person gets a single point. The driver with the most points is named the Busch Sport Scene Driver of the Year. 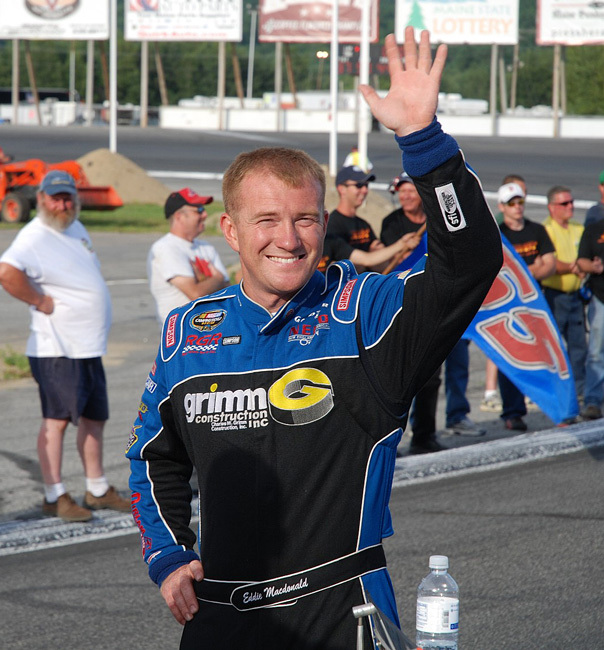 Eddie had one of the most amazing years on the racetrack, by any driver from the northeast in recent memory. As a full time competitor on the NASCAR Camping World Series in 2009, Eddie finished runner-up for the series championship, falling just 34 points behind series champion Ryan Truex, who drives for the Michael Waltrip Racing team. Eddie notched ten top tens and a pair of pole awards in his best career season in the CWS. 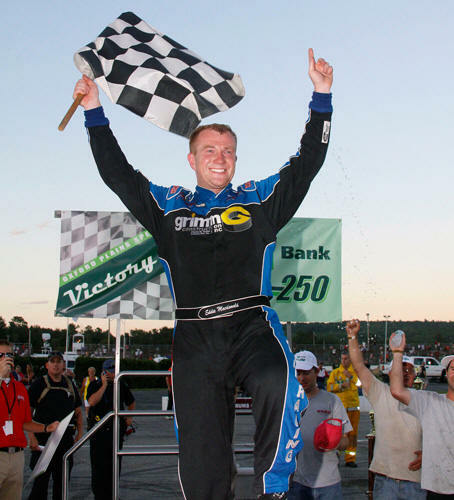 Eddie also won the 2009 Track Championship at New Hampshire Motor Speedway. Driving the No. 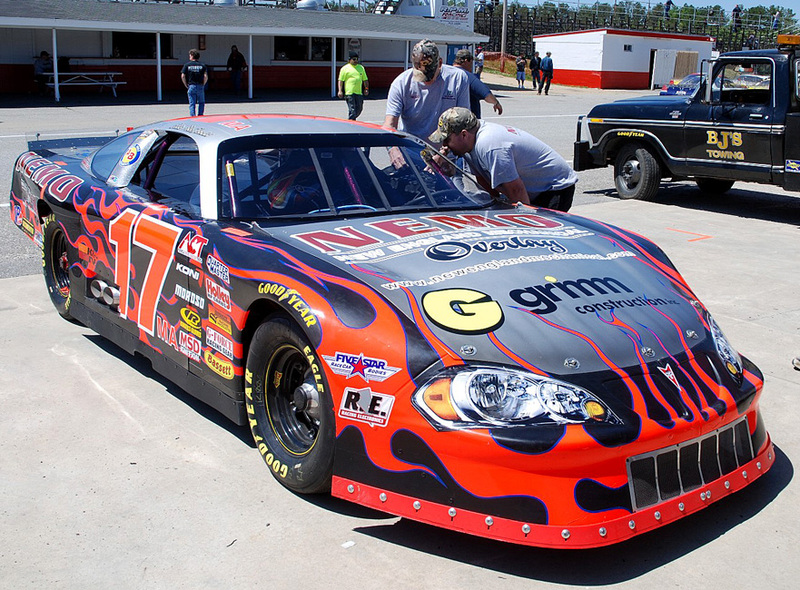 71 NEMO/Grimm Construction Chevrolet, Eddie finished sixth in the Heluva Good! 125 in June and won the second Heluva Good! 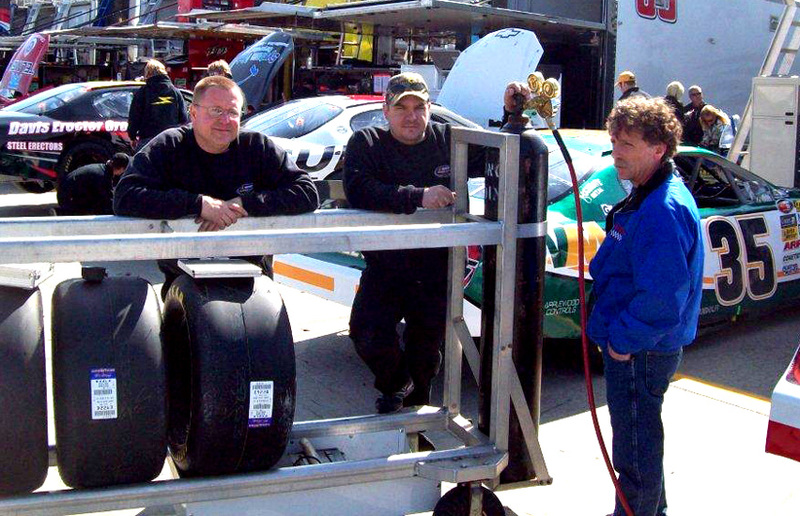 125 in September, which led to his second consecutive NHMS Track Championship. 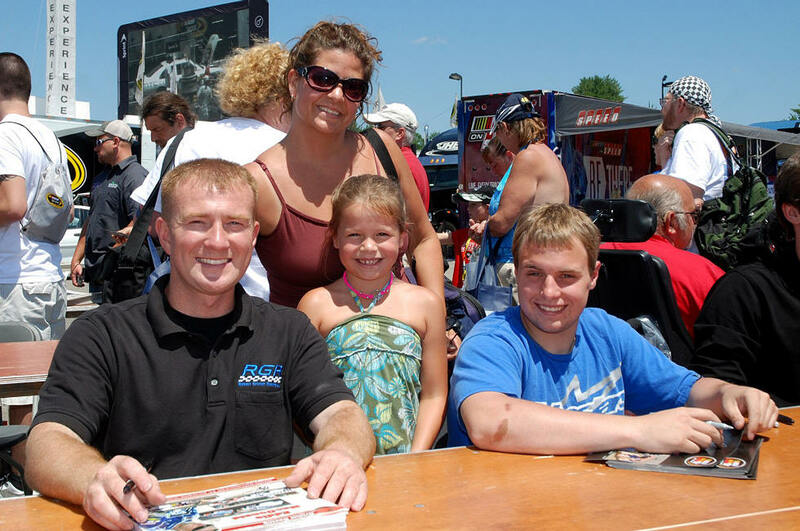 Making Eddie's 2009 season even more remarkable is the other races he ran outside of the NASCAR Camping World Series. 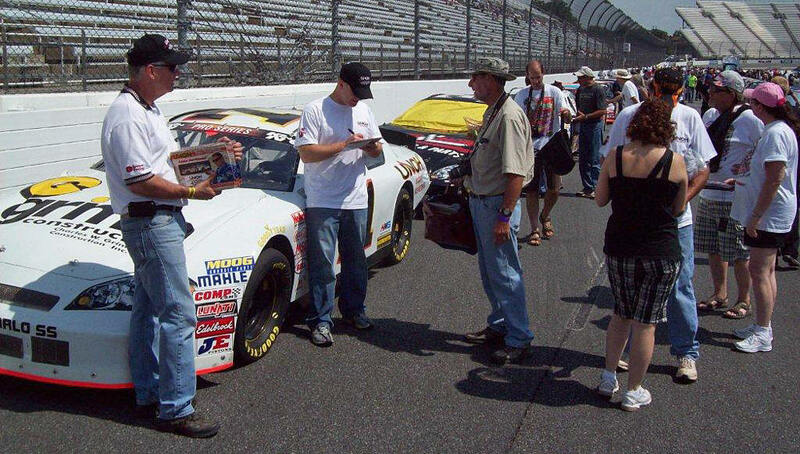 Eddie also raced a NASCAR modified car at New Hampshire Motor Speedway and a super late model in the Pro All Stars Series. 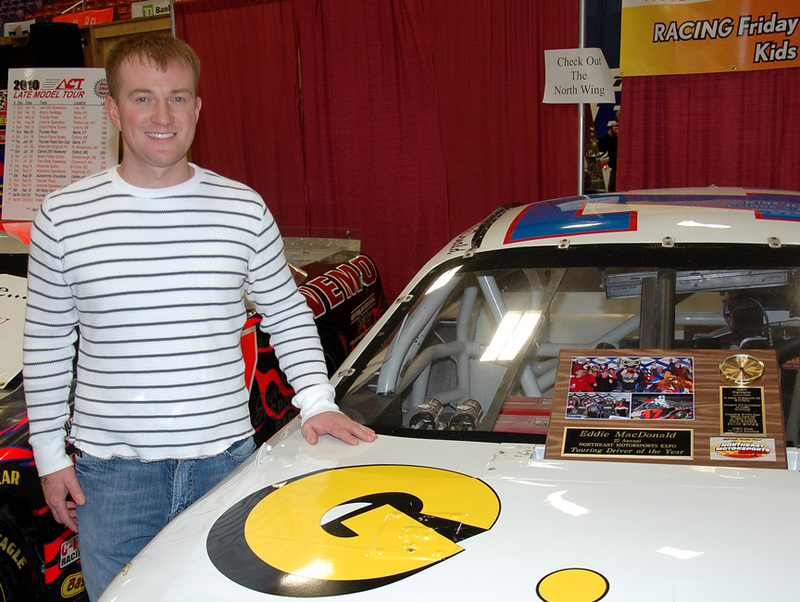 But his most impressive performances of the 2009 season came in a late model stock car. 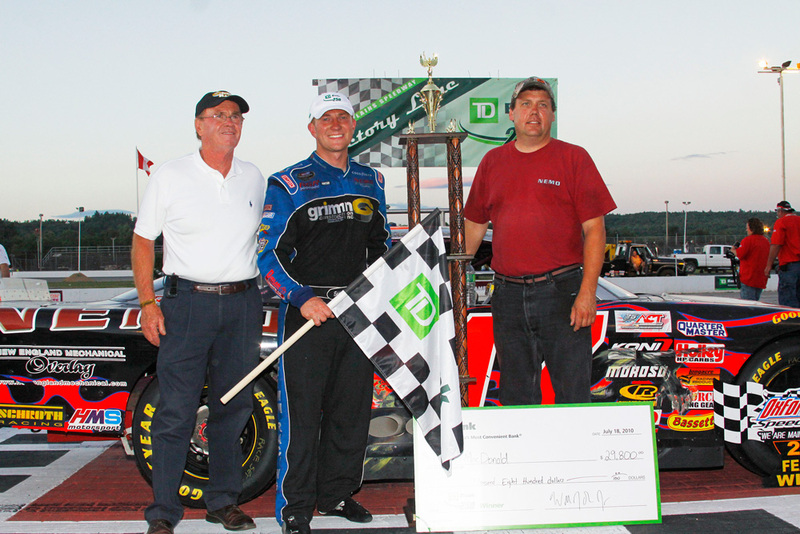 Eddie won the prestigious TD Banknorth 250 at Oxford Plains Speedway with his late model in July. 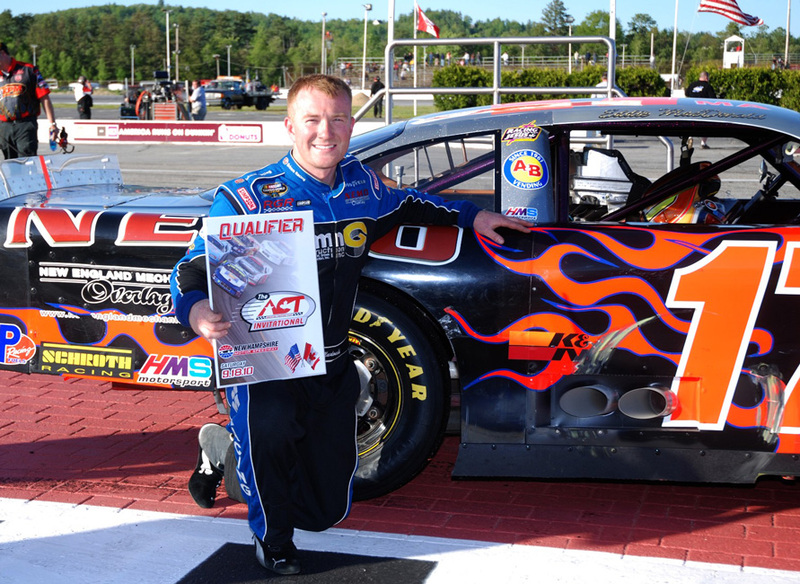 He then followed that up with an amazing win in the American Canadian Tour's Inaugural ACT Invitational at New Hampshire Motor Speedway in September - on the same weekend as he won the NASCAR CWSE Race at NHMS! 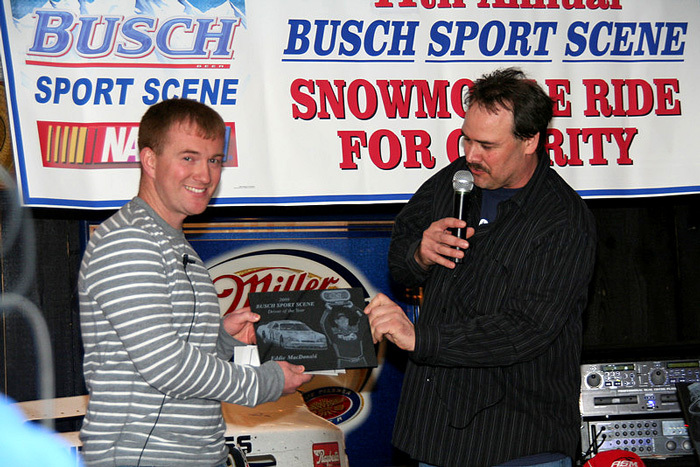 Eddie was presented the Driver of the Year package that featured a $1000 gift Certificate from Bo Built Race Car Bodies. bo Built has sponsored the award for several years now. 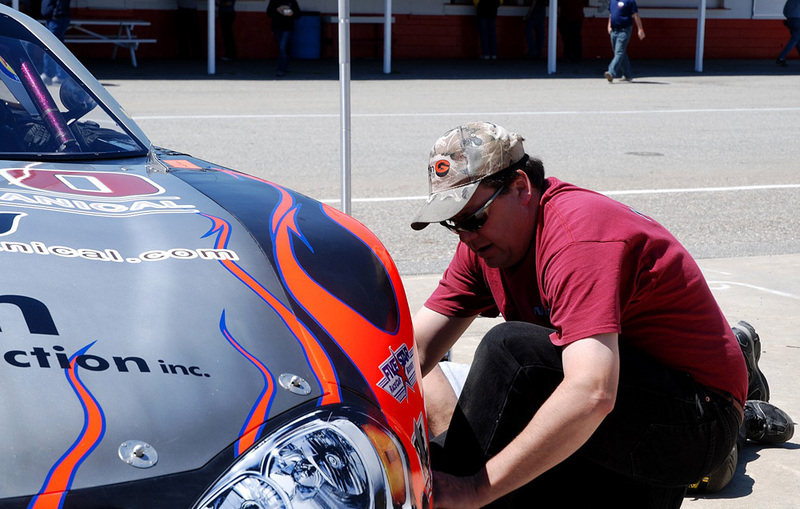 Bo & Sally Galloway of Bo Built Race Car Bodies provide the best bodies for many of the premiere race teams in the region. 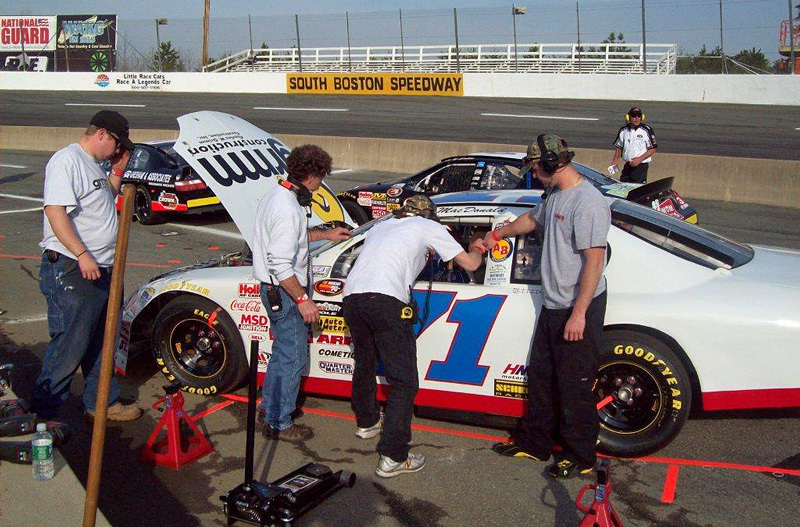 Based out of Weare, NH, some of Bo Built's winning clients include 2008 NASCAR Camping World Series Champion Matt Kobyluck and Two-Time New Hampshire Motor Speedway Champion Eddie MacDonald. 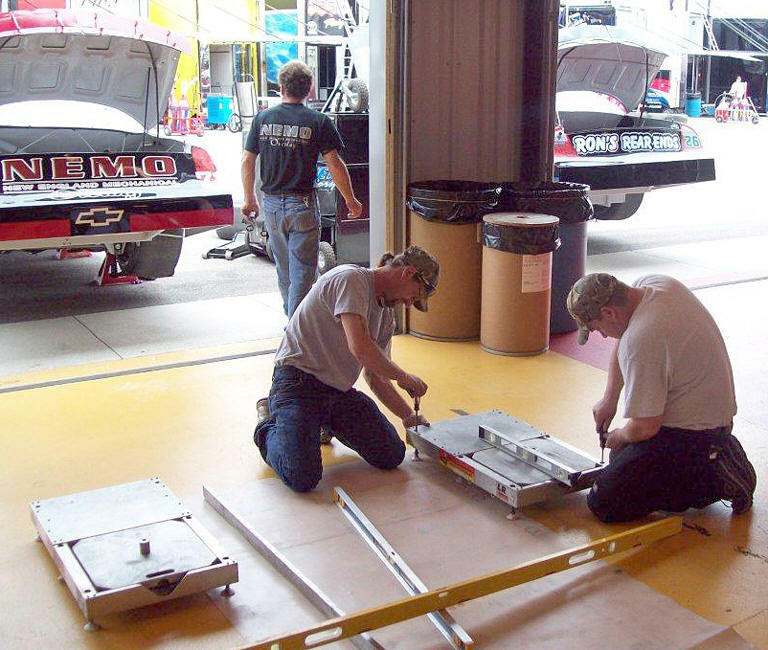 Bo supplies stock car bodies for four of the top ten finishing teams in the 2010 Toyota All Star Showdown, including the winning team, Fadden Racing! Get-Etched again provided the winners plaque, a beautiful granite etched plaque honoring the annual award winner. They also included a gift certificate for Get Etched products. Previous Driver of the Year winners include Brad Leighton, Andy Santerre, Mike Olsen, Joey Logano and last year's winner, Matt Kobyluck. 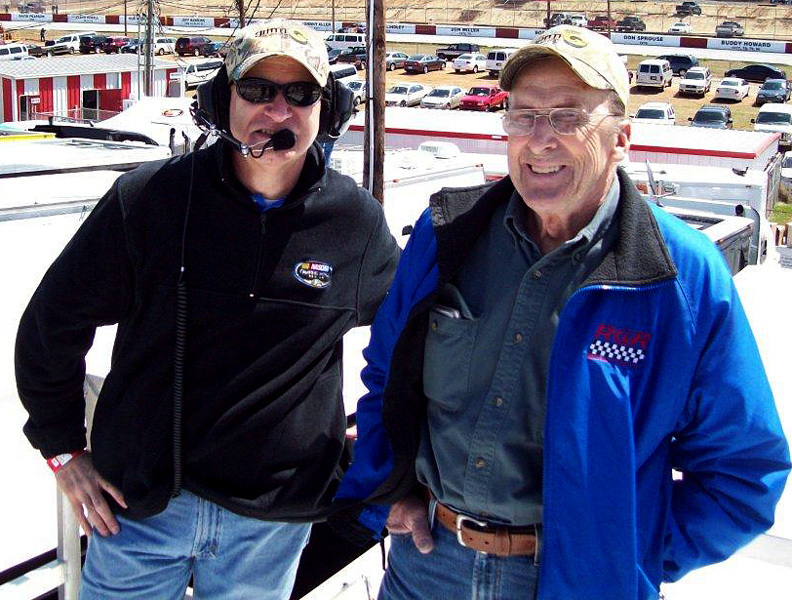 "I'm especially happy to have Eddie win the Annual Busch Sport Scene Driver of the Year award," Busch Sport Scene publisher George Campbell said. "Eddie is such a talented driver and had an incredible year, he really earned this award, he had one of the most memorable seasons of a New Englander in recent history." Brian Hoar was named runner up this year after his great year, which he capped off by winning his sixth American Canadian Tour Championship. 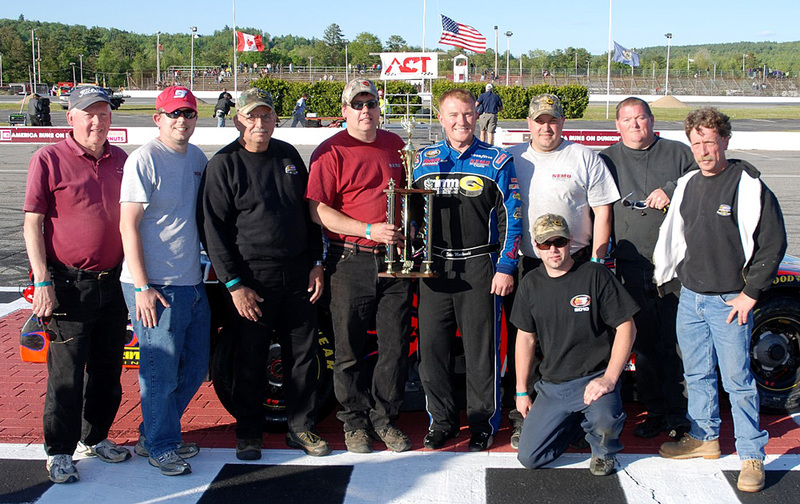 His first win of the 2009 season, and 24th of his ACT career, came when the ACT Tour made it's return to Beech Ridge Motor Speedway in Scarborough, Maine last July. 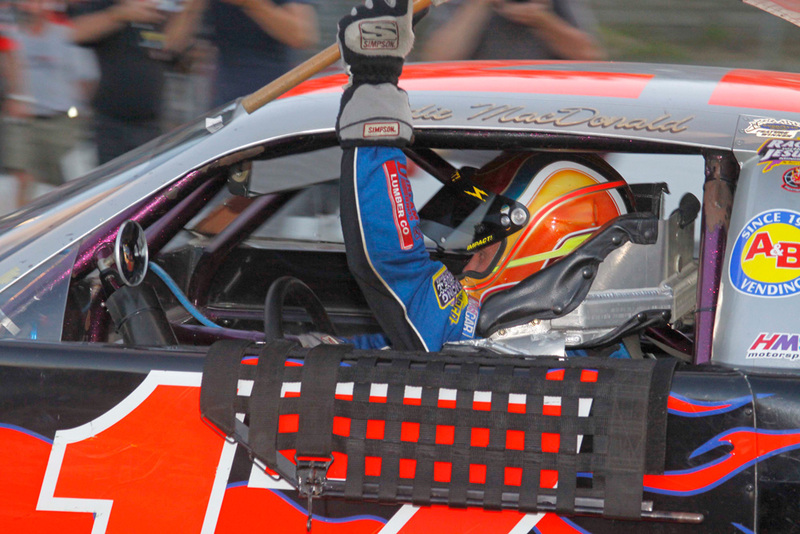 He followed that race up with another win, this time at Waterford Speedbowl in Connecticut. After presenting MacDonald with the Driver of the Year award, next up was the Busch Sport Scene Fans Favorite Driver award. This award is voted on by the readers of Busch Sport Scene and the popular motorsports website, neracing.com The readers are asked to send in the name of their favorite driver through the month of December. 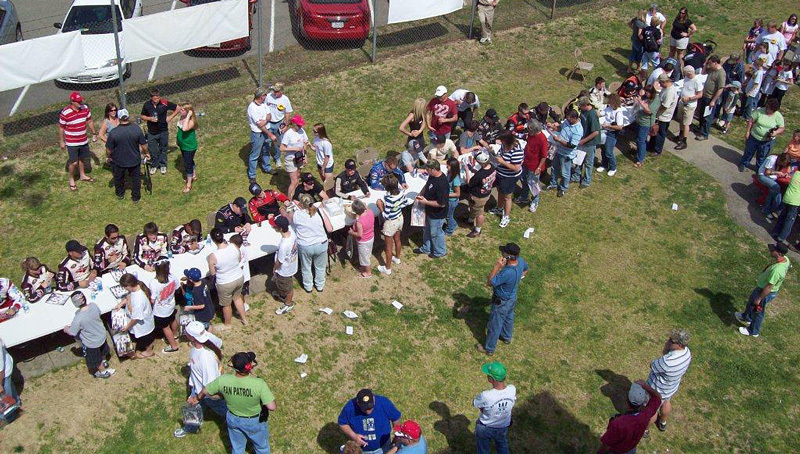 They are asked to name the driver they most like to watch and follow when they attend races. "We received a long list of drivers names this year," Campbell said. 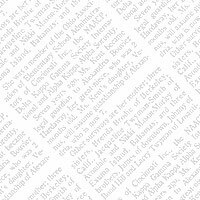 "Each week received a variety of names. But as the names added up, one drivers name kept coming in with strong consistancy. It seemed as though for every new drivers name we received, we received another vote for Eddie MacDonald. by the time voting closed, Eddie had nearly a 2 to 1 landslide win this year." 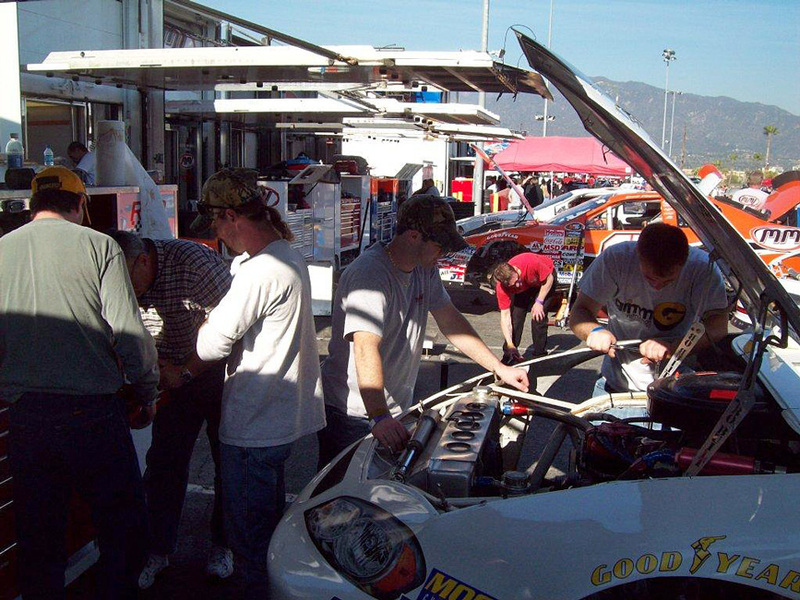 The seventh running of the Toyota All-Star Showdown in Irwindale, California did not start out as planned for the Grimm Construction Chevy. After struggling through both practices and a disappointing qualifying run, the team rebounded to finish a respectable eighth place. 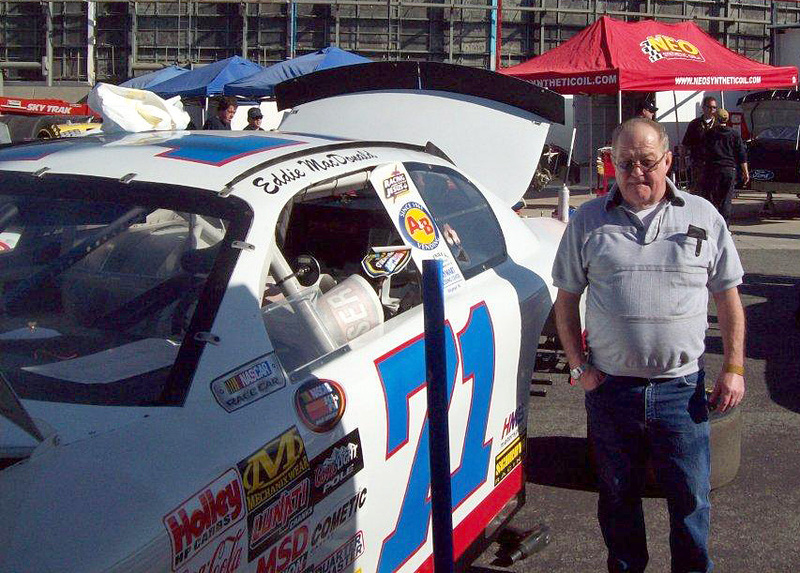 Eddie MacDonald, driving in the newly sponsored K&N Pro Series, battled back from as far back as 23rd position to post the satisfying finish. qualifying, we planned to go out for the first 100 lap segment, see what the car needed, then make adjustments during the ten minute break." The first practice only produced a 31st fastest time and after more adjustments, Eddie Mac was only able to improve four positions in the second practice with a time of 19.314 seconds. In qualifying, the Rowley, Mass. 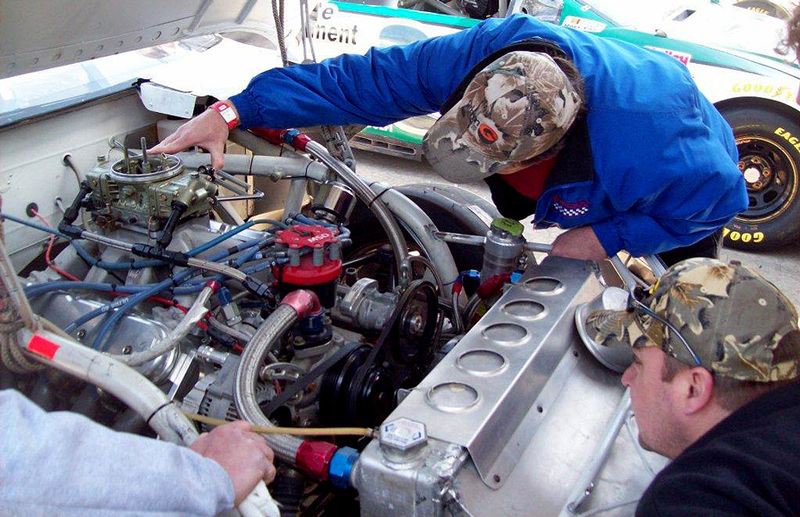 driver shaved off over six tenths of a second with a time of 18.711 sec. to earn the 17th starting positions on the grid. shocks because that would have made all the difference. Instead we made a number of small adjustments and the car was a lot better after the break. It was still bouncing but not nearly as bad as it was before the break. Rollie and the guys got the car much better in the turns and we were able to pass some cars. Now we were going forward instead of going backwards." to mount a charge. By the second mandatory break on lap 201, MacDonald was in eighth place and geared up for the final 25 laps. "The way the car was handling by then I thought we could get a couple of more spots but there weren't enough green flag laps in the final 25 laps because of the two cautions. We lost the momentum we had before the break. The yellow flags killed any chance for us to move up. We expected a better finish but after the start we had, finishing eighth isn't too bad. We are not thrilled but it was decent considering everything." 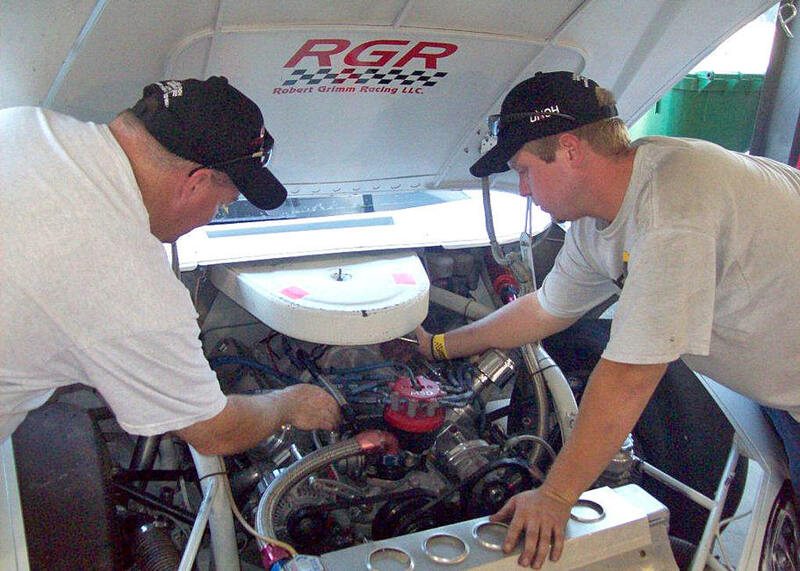 "I have to thank team owner Rob Grimm, Rollie and the crew for all the hard work. They just never give up. The trip requires a lot and we couldn't do it without the support of our sponsors who have helped us through the years. 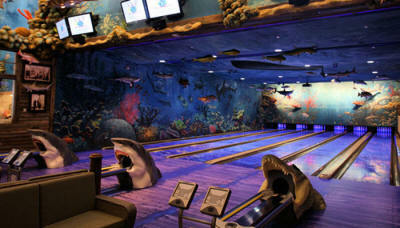 Of course, Grimm Construction, Waymart Building Center, R.B. Fries, NEMO-New England Mechanical Overlay, Racing with Jesus, Hanover Place, Hancock Electric, Bethel Woods, and HMS Motorsports have been there for us and we greatly appreciate it. 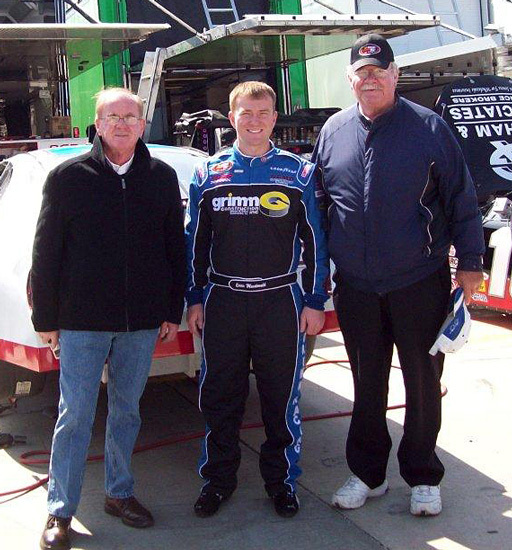 This has been a lot of fun and we can't wait for our first points' race at Greenville Pickens Speedway on March 27th." 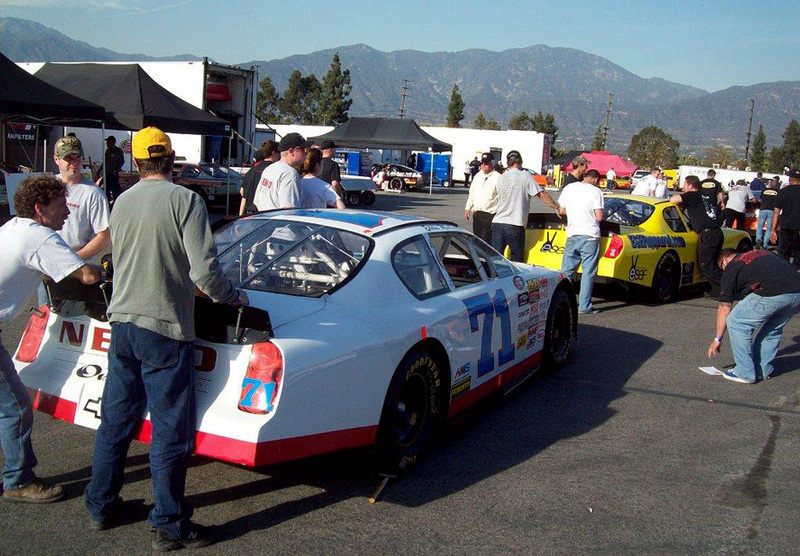 Even though the Toyota All-Star Showdown in Irwindale, California on January 29-30 is regarded as a post season event for the East and West series, Eddie MacDonald and the Grimm Racing Team feels it is the kickoff to the 2010 schedule. Touted as the “Daytona 500 of Short Track Racing”, the team would like nothing better than a win in the prestigious race. Last season, The Grimm Racing team posted some stellar numbers for an independent team racing against the developmental teams sponsored by Cup organizations. MacDonald finished second by 34 points to Ryan Truex, a driver for Michael Waltrip Racing, while posting ten top ten finishes. 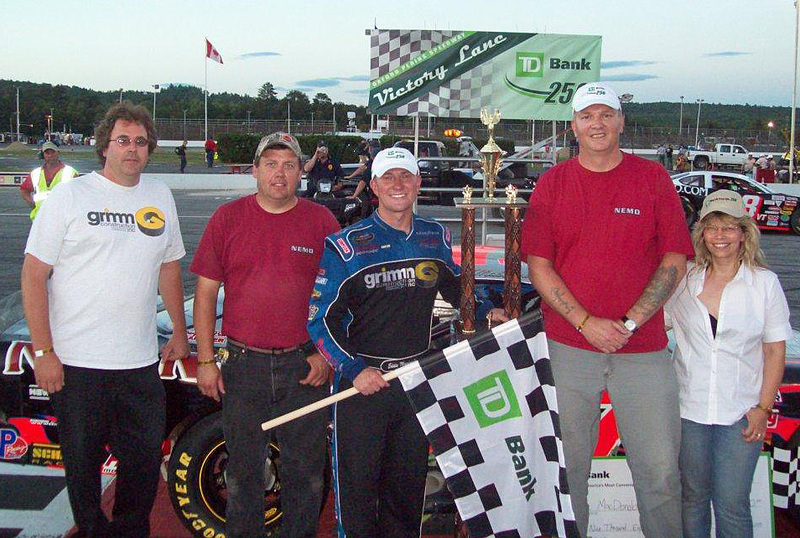 MacDonald won the September race at New Hampshire Motor Speedway after finishing sixth in the June event. For his efforts in the two races, MacDonald won the Lincoln Electric/Airgas NHMS Track Championship for the second year in a row. Also, MacDonald raced to two pole awards. 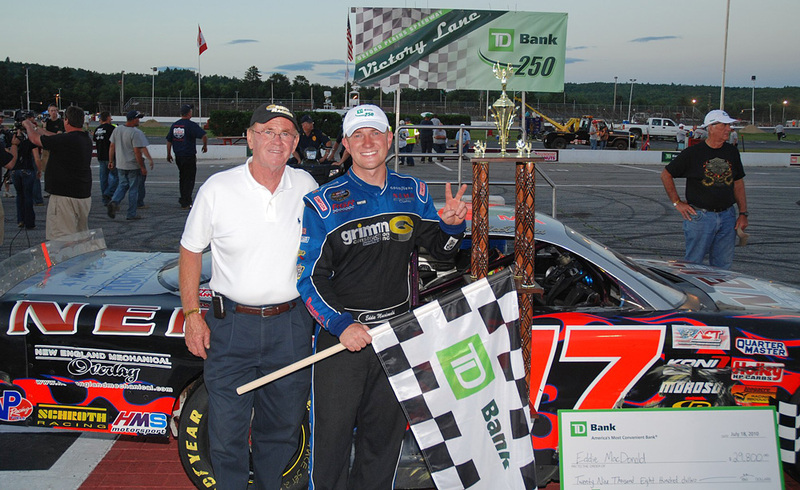 The success continued as MacDonald, along with crew chief Rollie LaChance and most of the East Series crew, won the prestigious TD BankNorth 250 at Oxford Plains Speedway and the inaugural American Canadian Tour race at New Hampshire Motor Speedway in the #17 Late Model. 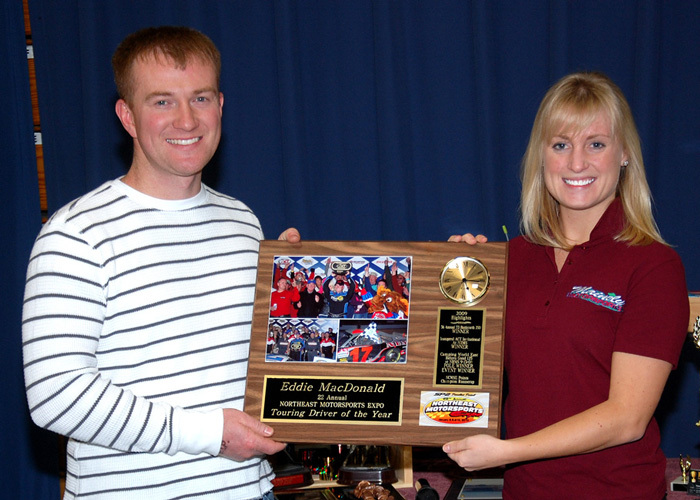 For his performance last season, MacDonald was chosen to receive the 2010 Expo Award for Touring Driver of the year presented to him by Amanda Leach from Mainely Motorsports. 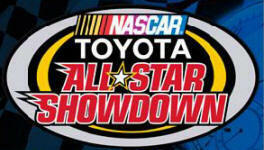 Speed Channel and Sirius Radio will cover both nights of racing. 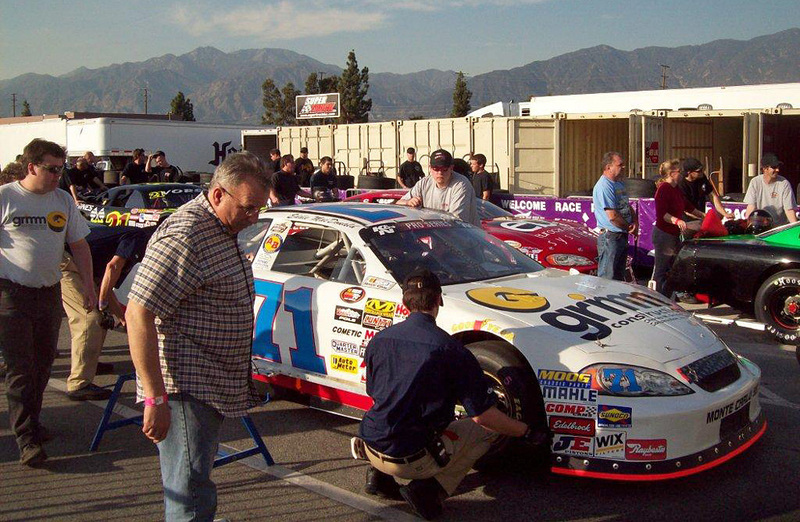 After posting a successful 2009 finish in the NASCAR Camping World East Series, Eddie MacDonald and his Grimm Racing Team would like nothing better than to begin the 2010 racing campaign with a victory at Toyota Speedway in Irwindale, California. By virtue of the September win at New Hampshire Motor Speedway, MacDonald is guaranteed a starting position in the seventh running of NASCAR’S Toyota All-Star Showdown in January in the Grimm Construction Chevy. This is the third full season with Grimm Racing and MacDonald expects great things this season saying, “Everything is on schedule. Rob continues to provide us with the equipment and support to win. 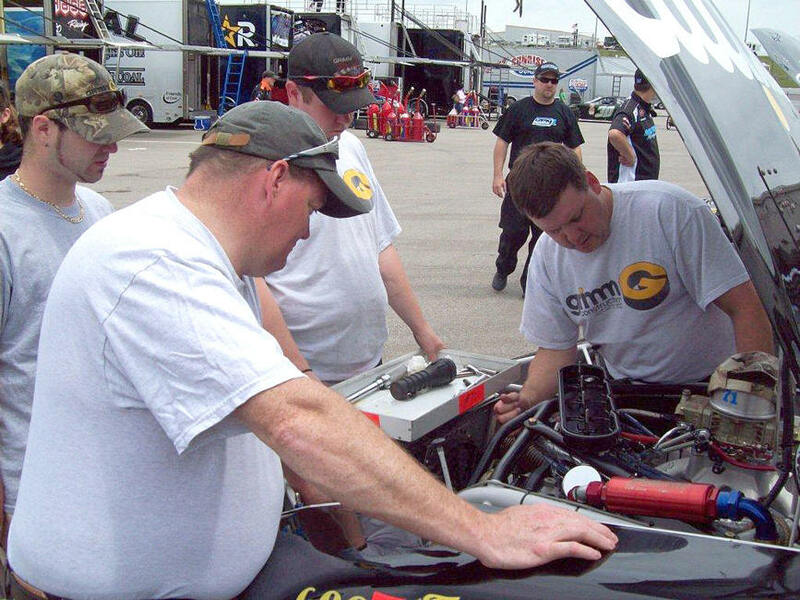 Just as the crew has been with the team since its inception the list of sponsors will again provide the necessary support that makes any team a success. Waymart Building Center, NEMO, A&B Vending, R.B. 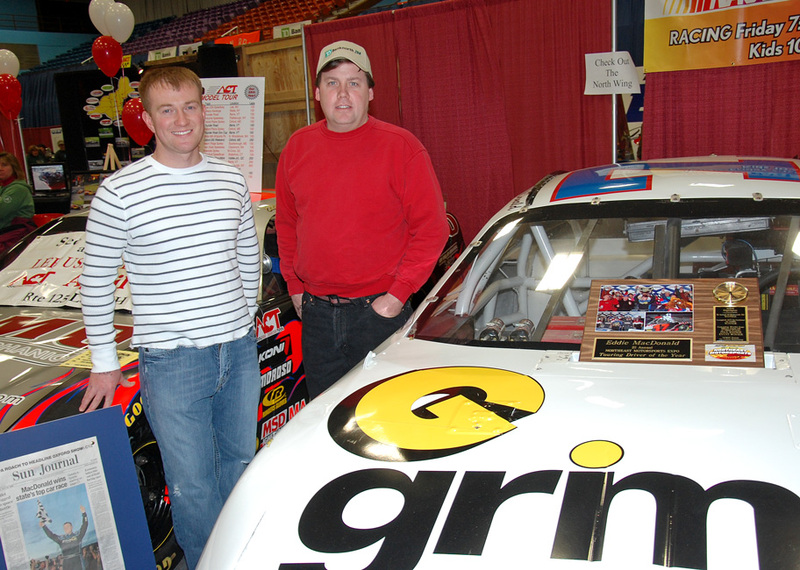 Fries Inc., HMS Motorsports, and Hanover Place will again be on board for the 2010 campaign. Speed will televise both nights of racing on January 29-30 that will include qualifying, a last chance 50 lap race, plus a 100-lap Super Late Model and 75-lap late Model races. Eddie was at the EXPO for all three days & was signing autographs. 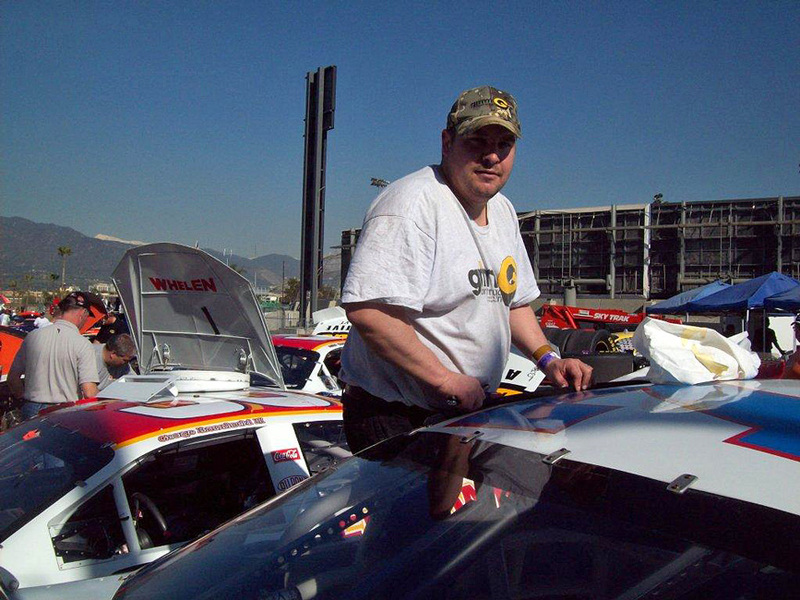 All-Star Showdown and his #17 Late Model were on display. 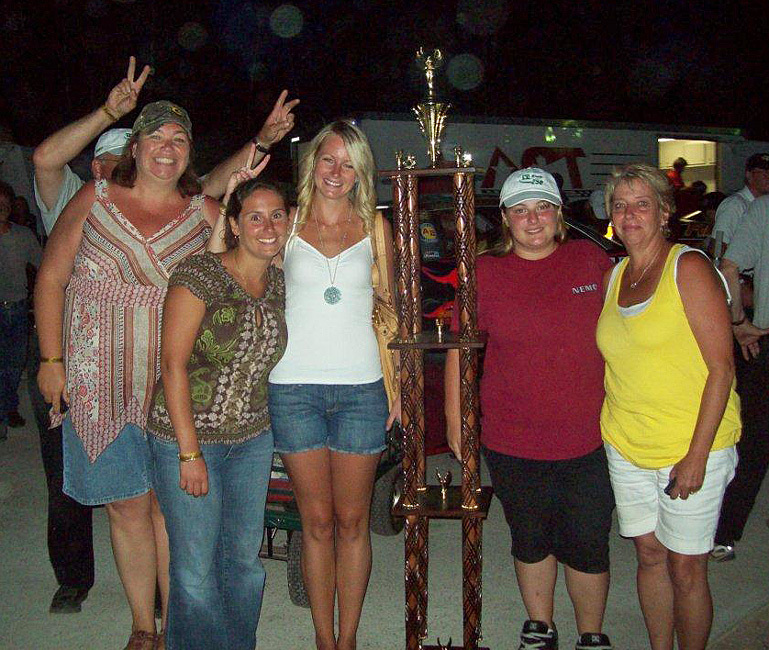 from Amanda Leach, co-host of the Mainely Motorsports TV show.